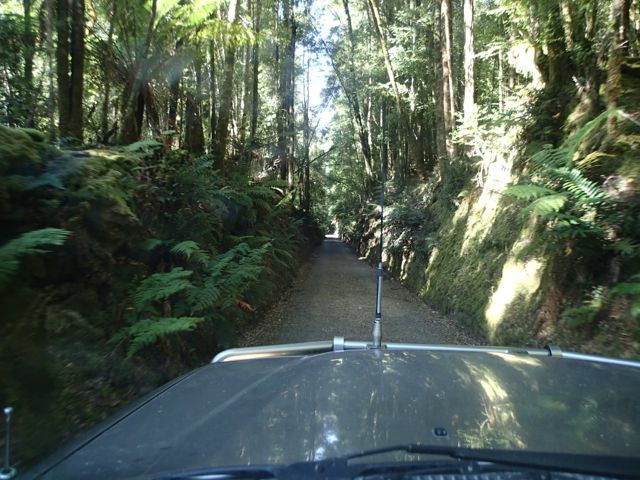 Headed up to Porongurup Range Tourist Park to catch up with all the lovely people there. Sammy also enjoyed catching up with Gypsy, Jak & the very much bigger Padlock. We were happy to look after the park for a day while Fredy & Ulli had a well deserved day of leisure with friends visiting from Mandurah. 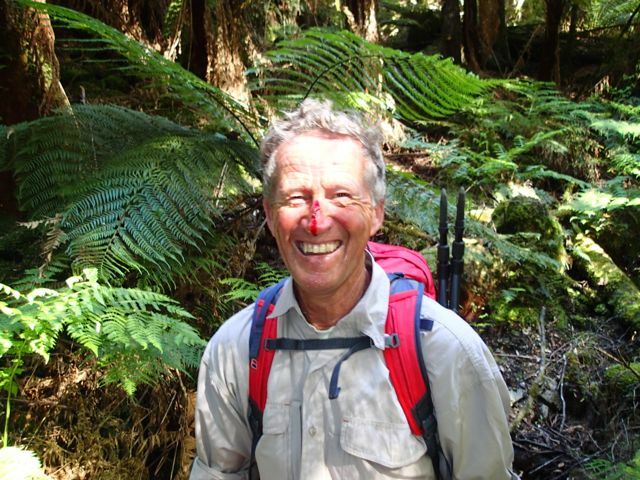 We finished off the last of the hikes on Porongurup Range, Nancy & Hayworth Peaks. We did the tour of the National Anzac Centre in Albany – well presented with lots of reading. Well we took our leave of Porongurup, topped up with all sorts of homemade jams, chutneys, olives and of course a supply of local wines and head back to Walpole for another 3wks of house sitting on one of our favourite spots in WA. There was more fishing with Dave & Patsy including a supply of smoked herring. Patsy also dressed a freshly caught rabbit ready for me to cook. I was pretty happy with my effort, being my first time at cooking a rabbit. 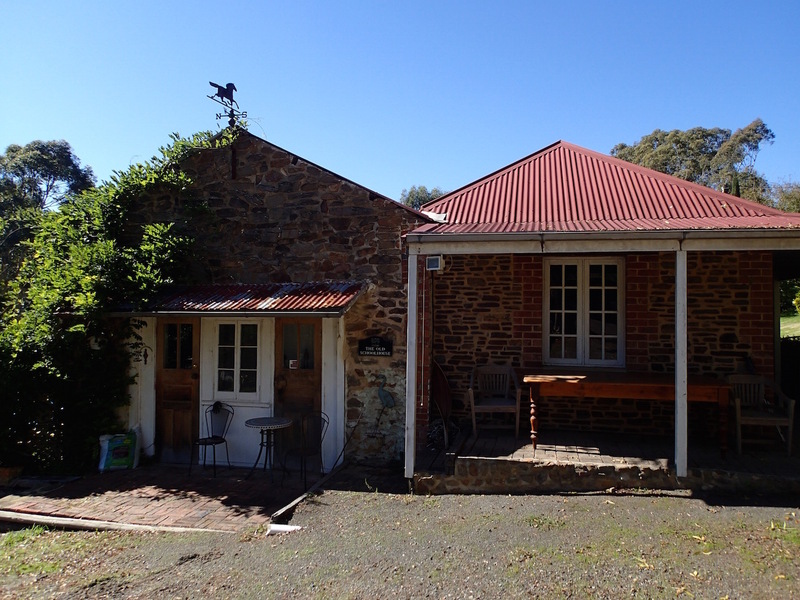 We managed to get a house sit at Glen Forrest in the Perth Hills so north we head again – round & round we go, taking in different areas each time. Heading north, we stayed at Quinninup Tourist Park. A little town that has a pub and a caravan park. It had resident roos & emus. The roo actually growled at Sammy. Other than Skippy😉, never heard a roo make a noise before. The emus were very inquisitive in checking out Glen & Sammy. One even checked out what was for dinner, looking through the kitchen window. We decided to support the local pub by having dinner & a drink. Only one other couple there for dinner. Our basic meal took over an hour and $70 later for a meal & drink each. WA really know how to charge. The most expensive state to travel through. Checking on whats cooking for dinner through the van window. Heard growling and out pops a kangaroo?? Next stop was Big Brook Arbetorum after travelling through Pemberton. 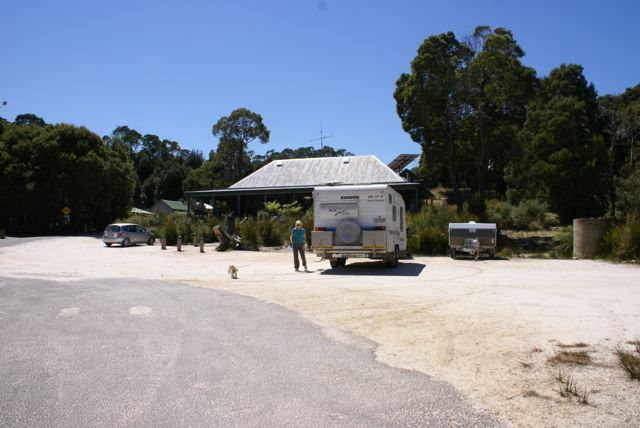 A campground in amongst Sequoias, Karri & Spotted Gums with toilets for $15 per night. Due to all the trees, not exactly solar friendly. We walked to Big Brook dam to do some geocaching and because that’s Sammy’s favourite thing to do. On our way to Margaret River we of course had to have a momentary pause at Whirlwind Olive Farm at Karridale. And of course couldn’t leave there without some garlic olive oil, olives & dukkah😋. 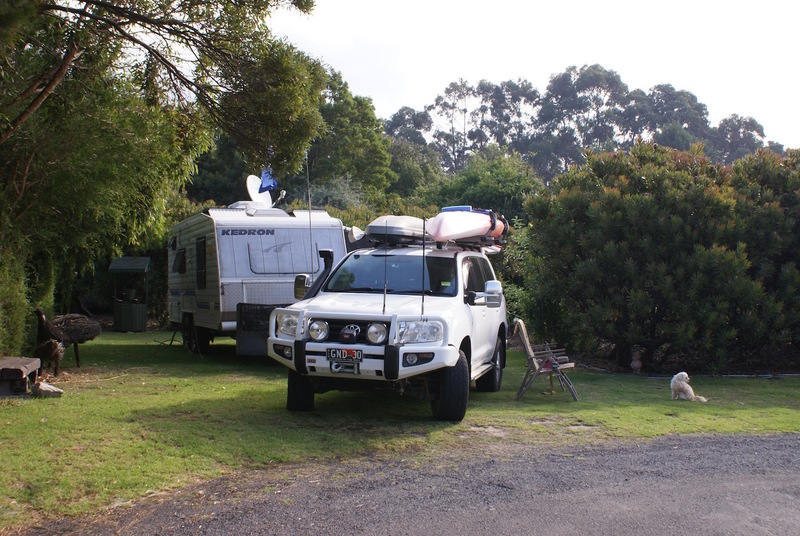 We camped at Big Valley Campground, a short drive out of Margaret River. 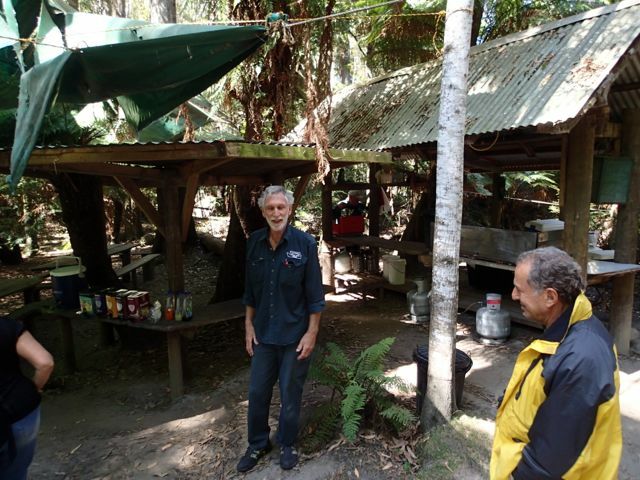 Another farm that has diversified by opening up for camping to help supplement their income. $32 pwd/$26 unpwd with toilets, showers & a communal campfire area. Totally recommend it👍 What was even better was the Cheers Wine Tour bus picks you up from the campground as well as the kennels for Sammy’s day care. Thoroughly enjoyed the wine tour (not so much the wine – yes I know that that will come as a shock). The itinerary for the day was Watershed winery, Bettenays Margaret river nougat company winery, Margaret river venison farm, Knotting hill vineyard, Margaret river choc factory, Margaret river dairy company (cheese) & colonial brewery. The wine making/appreciation session at the first winery was really interesting and lunch was yum. Really enjoyed the venison from Margaret River Venison – wish I had have bought more. 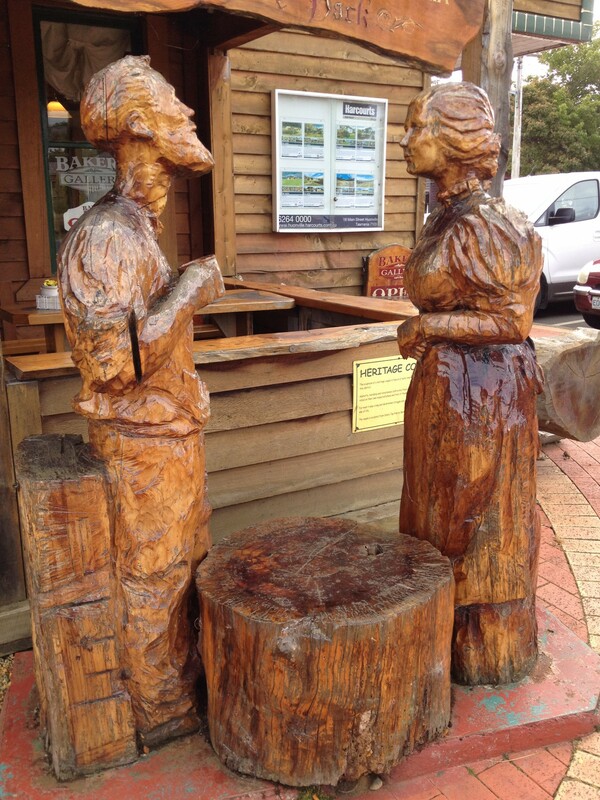 Our third day at Margaret River we checked out Laurance winery, canal rocks, Yallingup, Bunker Bay, Dunsborough, Busselton and last but not least finished off the day at the berry farm – yum. We continued north, planning to stay overnight at Herron Point again but was all booked out. So we stayed the night at Pinjarra RV rest area, a free camp in town with a nice walk along the river and over the suspension bridge and geocaching of course. Had a great time in Walpole looking after a house on five acres with a few sheep (who loved eating oranges), chooks (free eggs) & massive gardens of fruit, veg & flowering shrubs. Glen was in his element on the mower with the joy stick for steering. I wouldn’t be surprised if he wanted to buy acreage just so he had an excuse to buy one😉. The next door neighbours, Dave & Patsy were very welcoming. 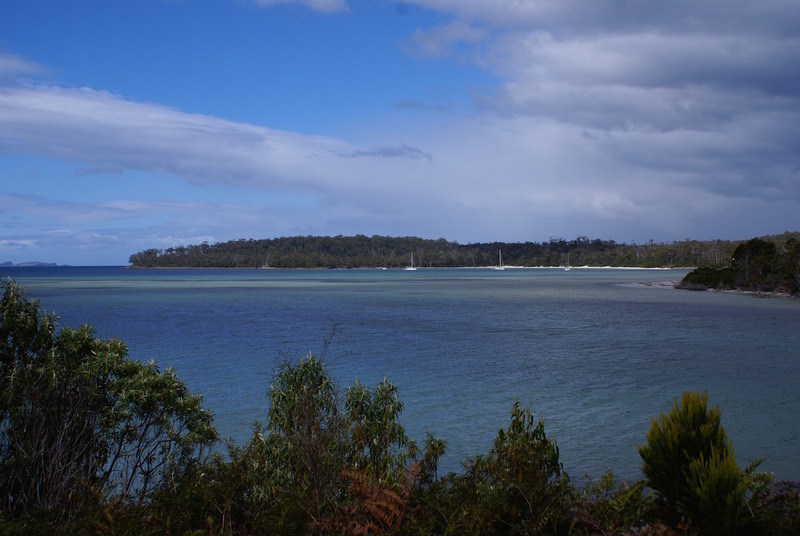 During our stay at Walpole, we went on the WOW boat cruise around the Walpole-Nornalup Inlets Marine Park out to the mouth of the inlet. You have the opportunity to walk over the sand dunes via a well worn track to the ocean side (our guide leads the way to check for a local snake that sometimes sleeps on the track😬). He then provides homemade cake, tea & coffee. The best part of the cruise is the knowledge he imparts and his very energetic personality. He has a box of dress up like items on the boat to help in describing & acting out whatever he is talking about – he was a bit like Steve Irwin in his enthusiasm. We joined the neighbours for a night of entertainment by “The Old Fella” who came fourth I think, on Australia’s Got Talent at the local community hall. A good laugh was had by all, especially one lady who’s laugh was quite contagious. He offered to pay her to join him on his rounds of the towns😉. 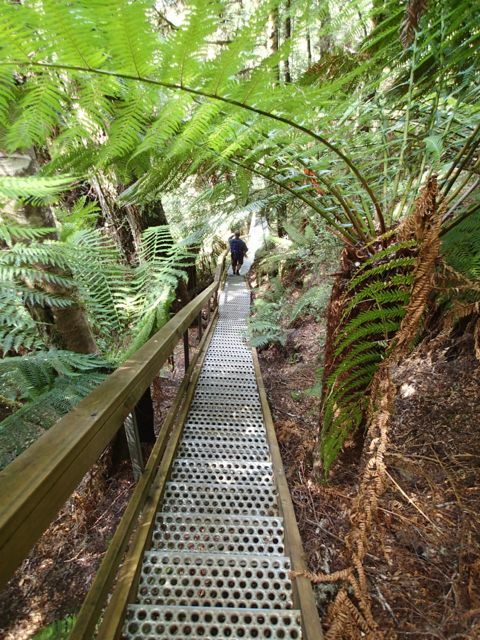 Our sightseeing from Walpole included Valley of the Tree Tops Walk. 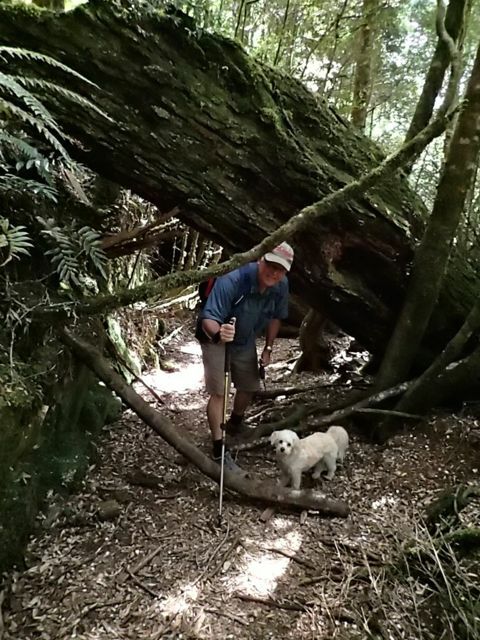 Due to us already doing the Ottway Tree Top walk (which we found disappointing) and Tahune air walk in Tassie which we really enjoyed. Anyho so we decided to do the free guided tour around the base of the Tingle trees which was very informative and glad we did it. 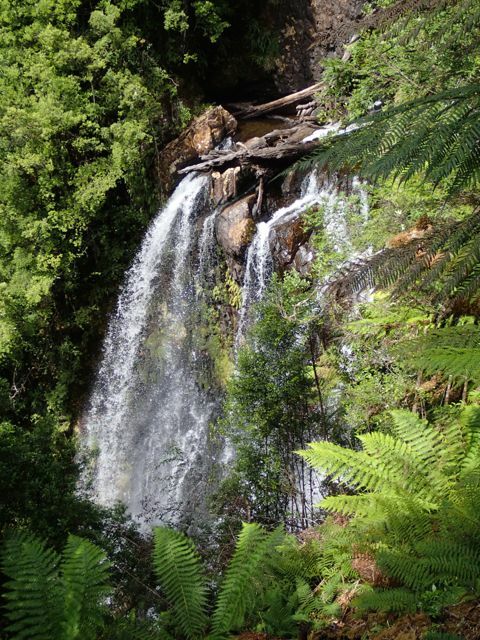 We drove out to Circular Pools, hiked up Mt Frankland & enjoyed the serenity at Fernhook Falls. Of course there was the obligatory honey tasting/purchasing, chocolate tasting, ice creams & fudge. We had the most expensive fish & chips at Peaceful Bay. 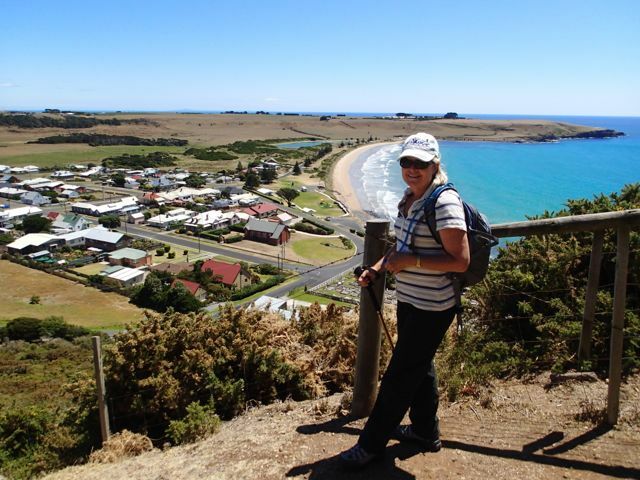 Checked out Parry Beach & Conspicuous Cliff. Glen went fishing at Mandalay beach with Dave & Patsy, next door neighbours at Walpole. And remembered to do some geocaching. 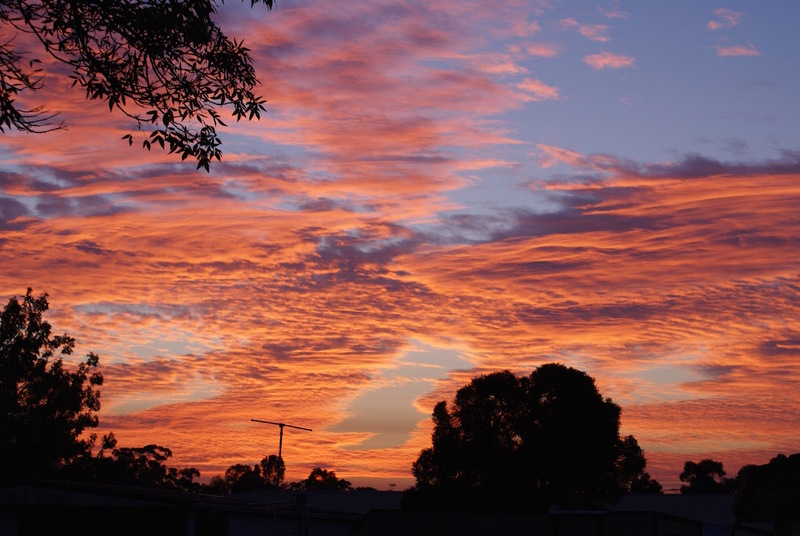 It was time for us to head up to our house sit in Baldivis. Approximately 45mins south of Perth. 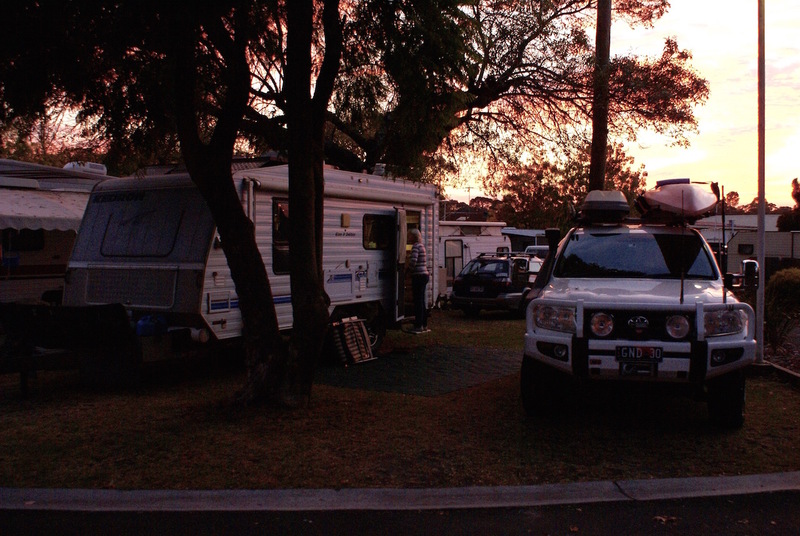 Our first night was at Greenbushes campground in their sports complex. A great free camp with toilets & showers. 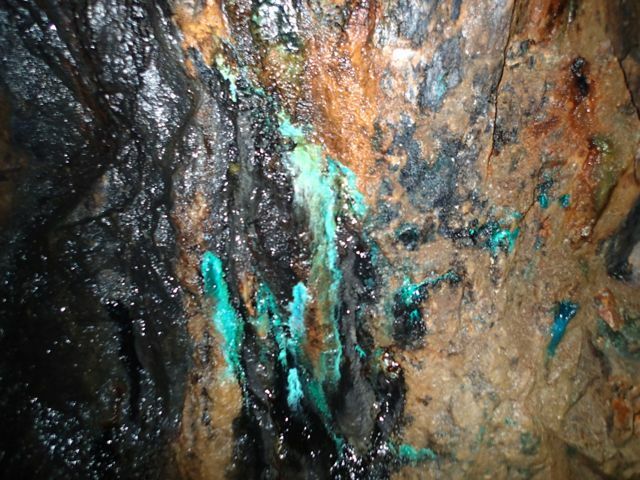 On our way to Greenbushes we checked out The Diamond Tree (2) south of Manjimup. 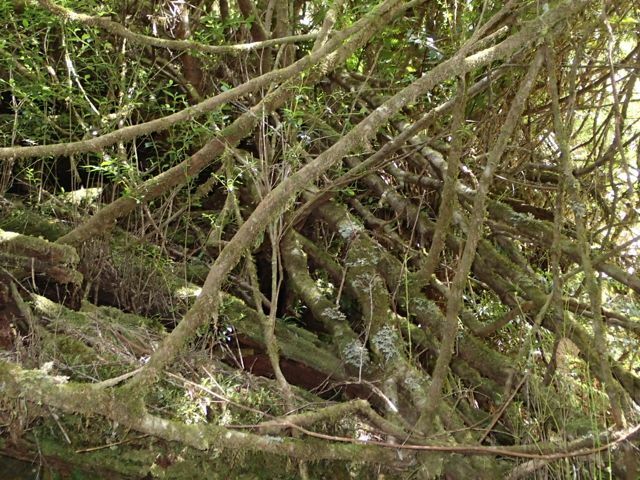 It is a Karri tree with a wooden viewing platform 52mt up, (well, so I’m told – neither Glen or I were in any hurry to climb it) and is the oldest wooden platform fire lookout still in use today. The Gloucester tree, the second tallest lookout tree in the world at 72mts is in Pemberton but you have to pay to see that one. What a great little spot. Only stayed one night, but have marked as a favourite for another time. Flushing toilets. The caretakers are sprucing up the place with artwork in the old toilets and the bins. No drinking water, but bore water for dishes etc. Fire rings for when the season permits. Great for the dogs on the beach. And don’t forget the geocache. In October, we spent three & half weeks house sitting at Baldivis looking after Gail & Adrian’s rammed earth house & 2 dogs which Sammy thoroughly enjoyed. Their dog Theo was a rescue dog and was a bit apprehensive but with Sammy’s help, he was able to overcome his fear of us, as you can see by the photo below. Our favourite spot was taking in the serenity, sitting out the back in the pergola area listening to the water trickling over into the fish pond full of Koi. 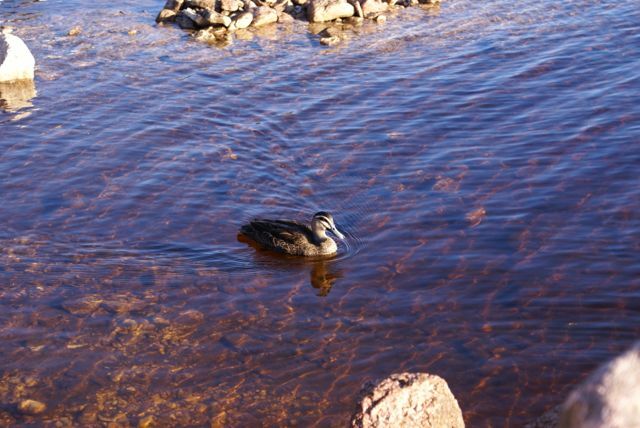 It gave us the opportunity to do sightseeing from Mandurah to Perth. A bush setting caravan park with drop toilets – $30 per night powered which you need to be on as too many trees for solar. A free camp beside a salt lake that somewhere down the track must have been used for water skiing, but the ramp was well & truly high & dry. 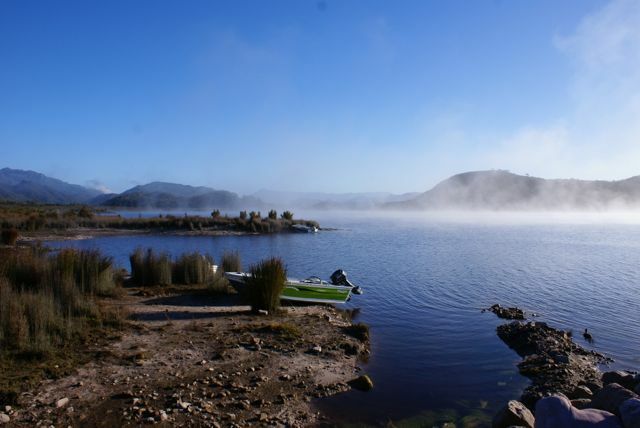 The lake was dry when we arrived but after a shower of rain overnight, we woke to 2/3 of the lake covered in water. Each day we would wake to a bit more water in the lake even though there had been no more rain. We then returned to Lake Nunijup (9) for a few days of R&R😉 before heading into Albany to have another element replaced in the Truma HWS😡. Follow the blue trail above. As our next destination took us past the turnoff to the van park, we decided to drop in and introduce ourselves. It turned out that the owners, Fredy & Ulli were in Perth visiting a sick friend. 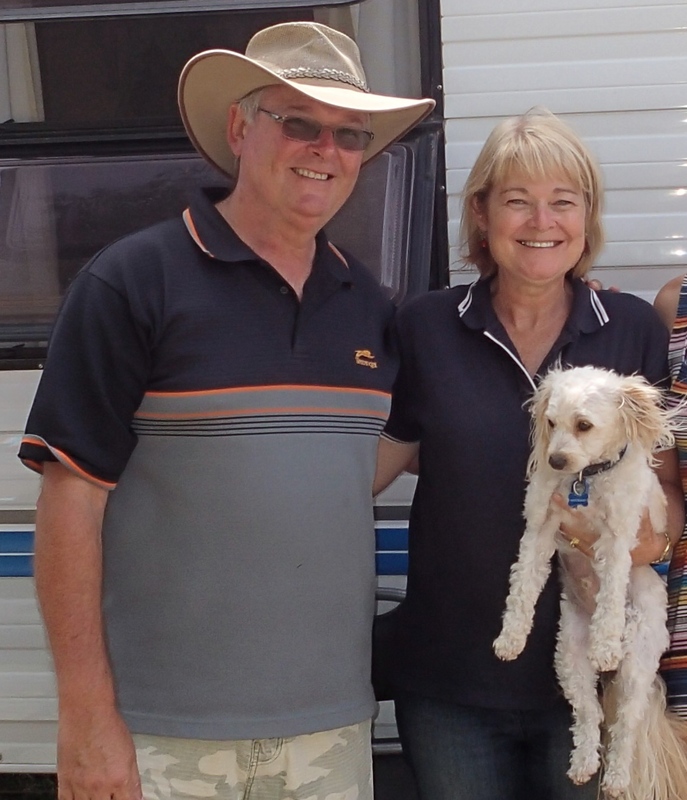 Their friends from Mandurah, Sue & Colin had been left in charge and made us feel very welcome. 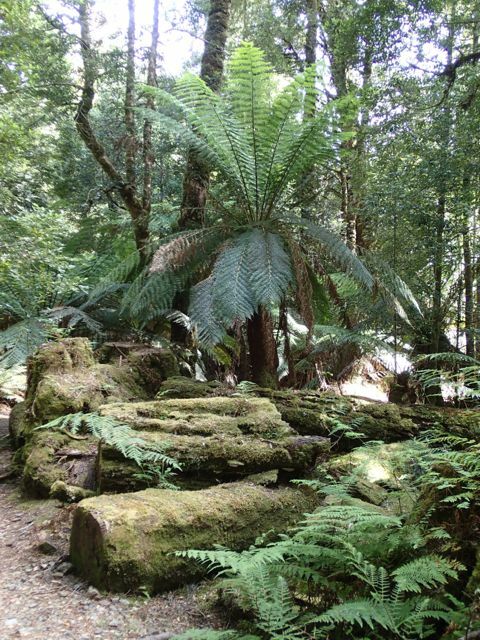 We loved the bush setting of the park and looked forward to spending a couple of months here. A great camp spot for $10 a night with showers & flushing toilets in a renovated shearing shed where they host the silver service Cambinata Extravaganza. This event celebrates the diversity & fabulous products of Heartlands using regional foods. Their yabbies are sold to restaurants in Australia & around the world. We found the tour of their processing facilities very informative. Drove up to Wave Rock at Hyden from the farmstay. By the time we got there, it was bucketing down. Glad we keep wet weather gear in the car. Shame we forgot to put it on. 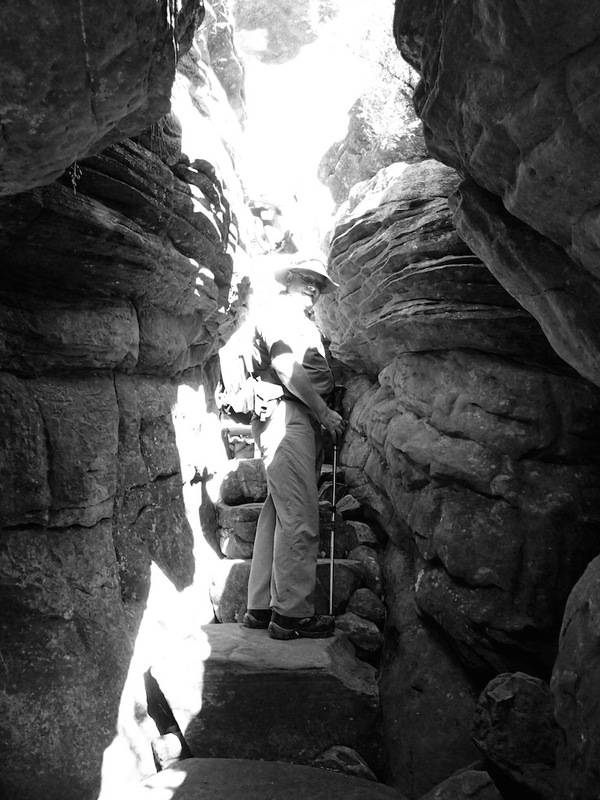 We did the walk around the breakaways that is just off the road before arriving at the Wave Rock car park. We ended up totally soaked even with the umbrella. Never seen Sammy jump in the car so quick. Usually we have to pick him up & put him in the car as he is still hesitant after being so car sick in his first 12mths. 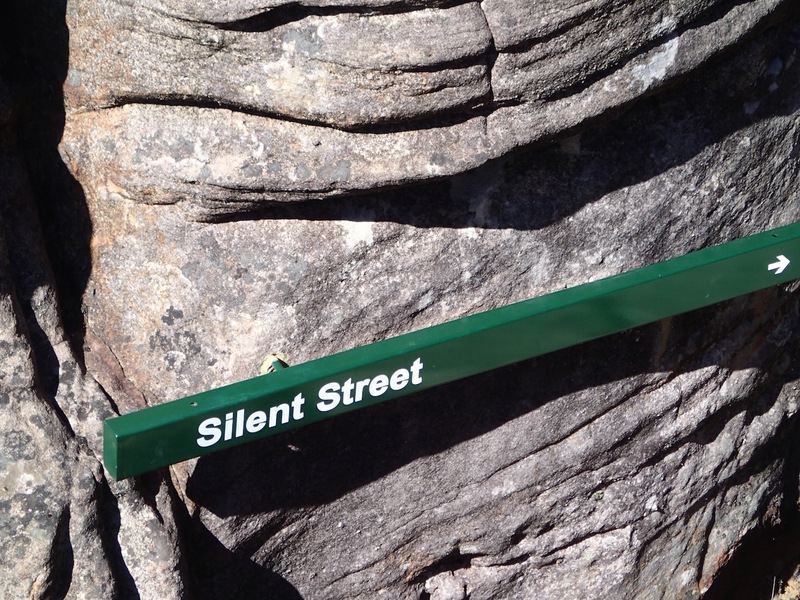 We decided to give Wave Rock a miss. 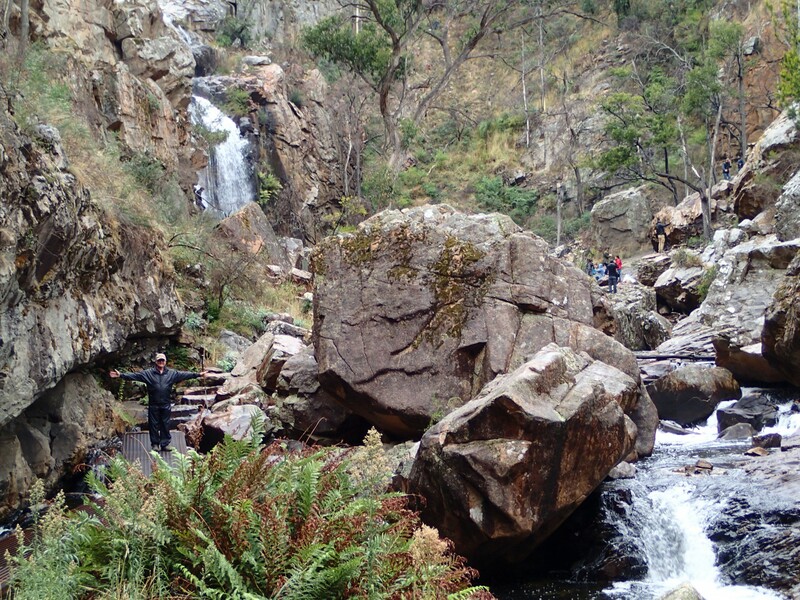 We had camped at Pildappa Rock in SA which we had been told was just as good and it was free. Besides the path leading up to Wave Rock was flowing well after the down pour. This is a great free camp with clean flushing toilets. Lots of firewood & a fire pit. Locals are very welcoming & happy that the camp is being used. You are able to park on what was once the tennis courts with the use of the verandah of the club house to ponder on how good life is, while watching all the black swans enjoying life on the lake. This became one of our favourite camps when in the area. Before heading back to Porongurup we decided to stop the night at the free 24hr rest area in Mt Barker to stock up on food & liquid supplies. Also decided to do our “pay it back” for the free camp & had dinner at one if the pubs. The recommended one (The Top Pub) was booked out unfortunately. 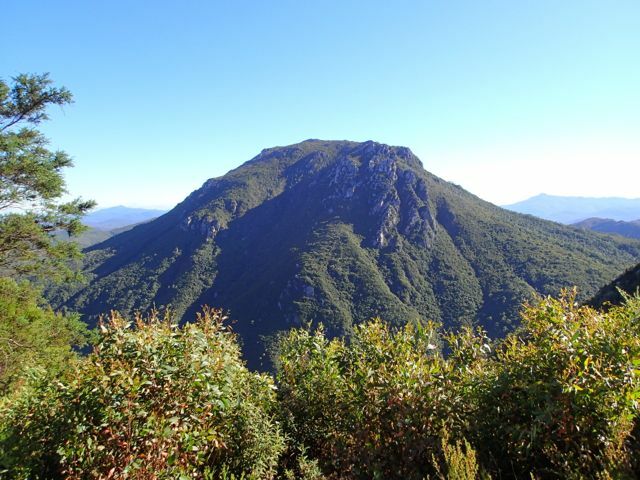 While in Tassie we applied for the position of caretakers for the Porongurup Range Tourist Park from July to September 2015 and were lucky enough to get it. The owners, Fredy & Ulli were taking a well earned and long time coming holiday to Phuket & visiting family in Germany. This was a new experience for us and thoroughly enjoyed it. 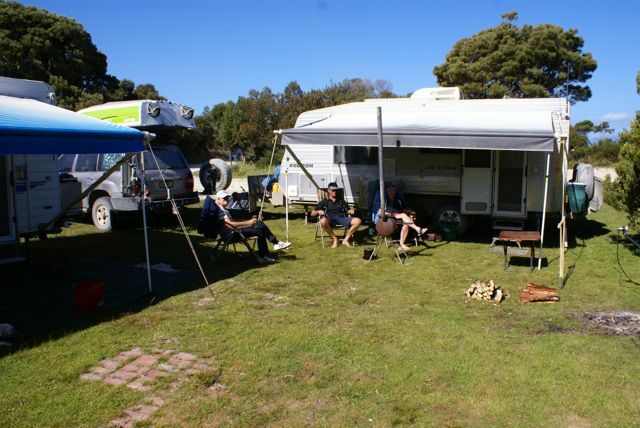 We did all aspects of managing a caravan park – telephone enquiries, bookings, cleaning of amenities, camp kitchen, gazebos & cabins, grounds maintenance – which was an ongoing battle with the so called “honky nuts” (gum nuts for us easterners:). Fredy said they would be slowing down over winter – yeah right😏. The black cockatoos and parrots thought it was great fun dropping them on the amenities roof. The community was very welcoming with being provided with local eggs, fruit, homemade jams & chutneys & wines. Thoroughly enjoyed all the wines that we managed to taste – a bit of a hardship, but we had to be able to advise fellow travellers staying at the park😉. This wine region is older than Margaret River and must say I much preferred their wines. 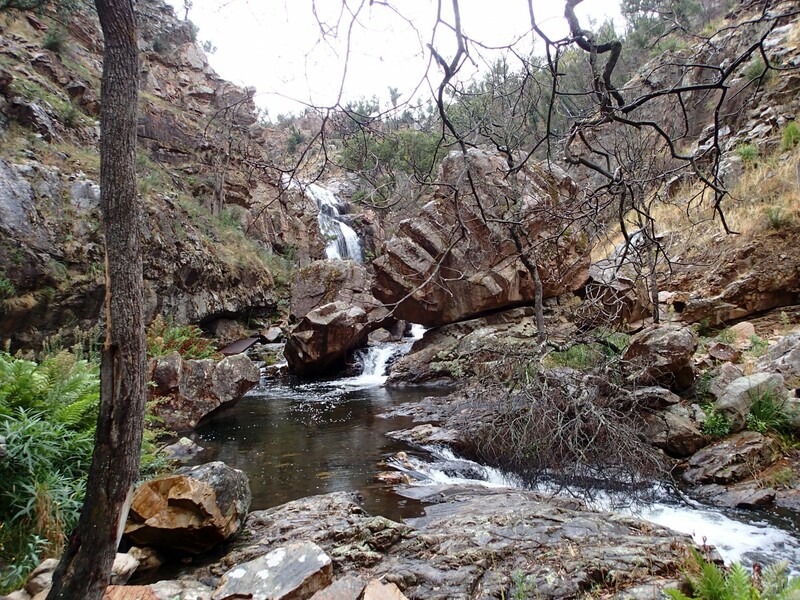 Porongurup is well situated for day trips to Albany & the Stirling Ranges. 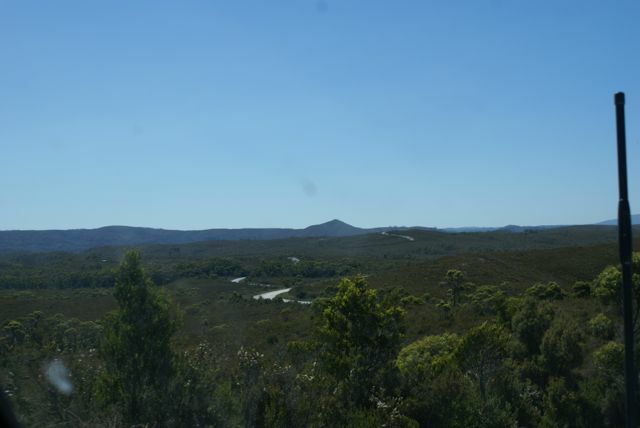 We didn’t manage any walks at Stirling Ranges but did the scenic drive through the centre. From the distance it looks like one long range, but is actually made up of lots of ranges/mountains. There was a couple of snow falls during our time there on top of the Porongurup & Stirling Ranges. 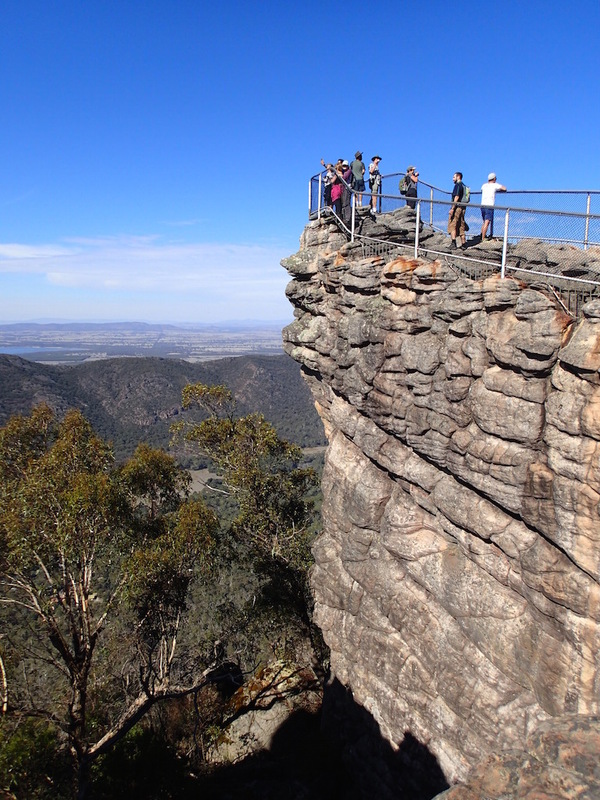 We opted to look at photos that some energetic people took ⛄️ We managed to do the Granite Skywalk & Devils Slide walks in the Porongurup Range – each taking approx 2 and a half hours including lunch and lots of pics. And would you believe we had forgotten to do the caches that were hidden on both walks 😕. Beginning of September we said our farewells to people who we had grown fond of. It’s sad that we are meeting and making friends with people we may never see again , but definitely adds to our travelling experience. During our stay at Porongurup the element had died in our third hot water system since moving into our van Dec 2013. So we had arranged for a replacement in Albany when on our way to a house sit in Walpole. Well don’t die of shock but have started on our Western Australia travels at long last. This has been quite a work out for the old brain to recall our travels from last year. After crossing the Nullabour, we headed south to Esperance. We camped at a free camp south of Norseman, Bromus Dam. Bromus Dam was built in 1925/26 by the railways to supply water for the early steam trains that plied from Coolgardie & Esperance. We followed the pipeline from the dam to the tank where we discovered a cache. Quite an interesting walk. 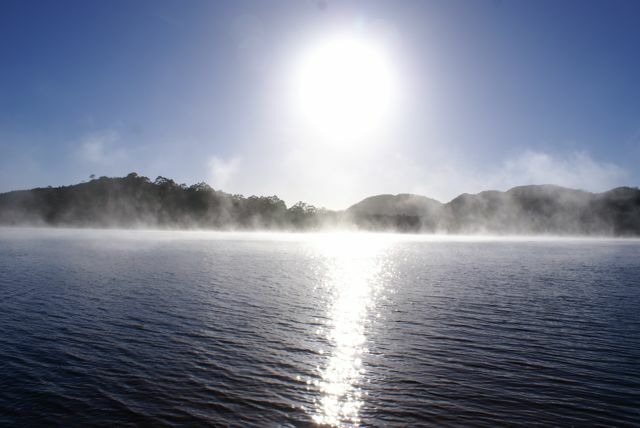 Prior to deciding to camp at Bromus Dam, we checked out a free camp, Jilah Rockhole south of Mundrabilla. It gave us the opportunity to test out the Tyre Monitoring System on the van when we staked a tyre😏. Worth every cent. 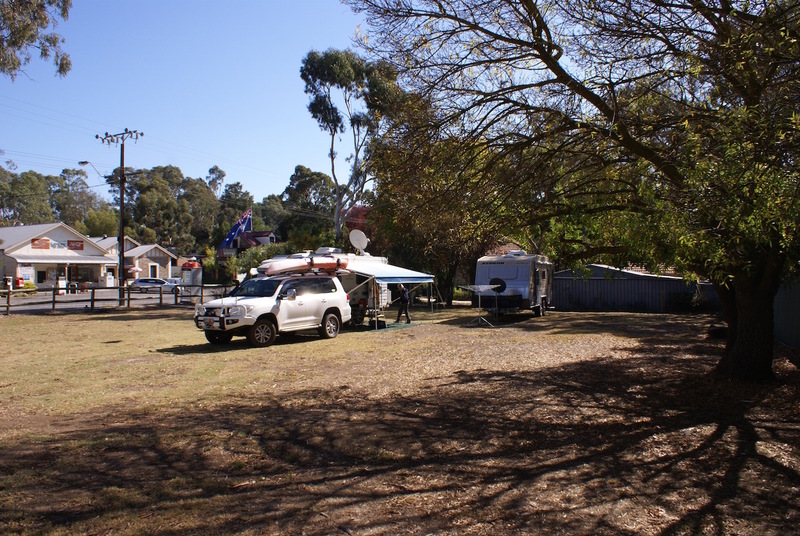 Continuing south, we then spent a night at a community caravan park at Grass Patch. A great little spot for a night or two, with power, water, amenities, BBQ & fire pit for $20. 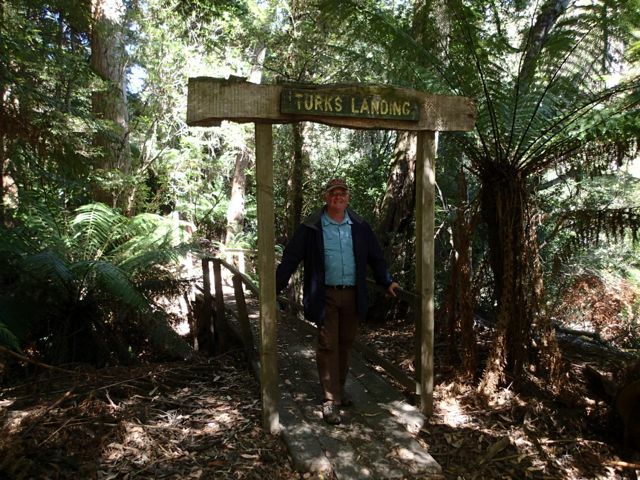 Love supporting these community caravan parks. And we remembered to find the cache. 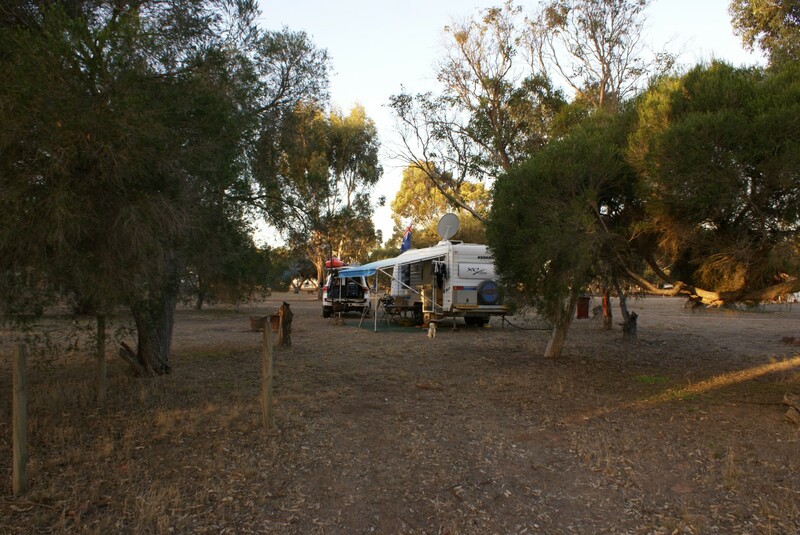 While exploring Esperance we camped at a Caravan Overnight Farmstay, Patroni Olive Farm for $5 pn, no facilities. They showed us the process they use for making their cold press olive oil still using a crusher & presser process from 500 years ago. It’s a husband & wife team doing all the work including picking the olives with a hand held shaker and net. A great camp for $10 per night with toilets. 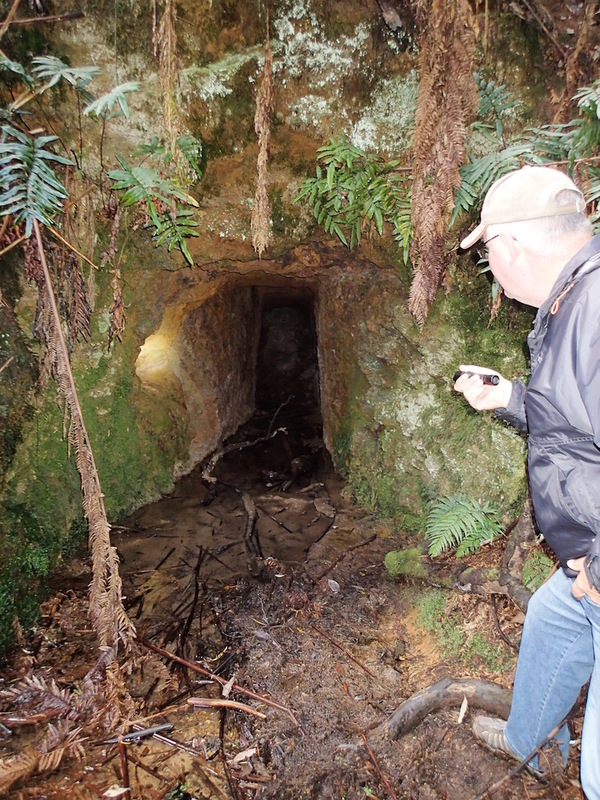 We drove out to Stokes National Park to do some geocaching and came across the ruins of Moir Homestead from the 1870s. Another great little campsite for $10 per night with toilets. 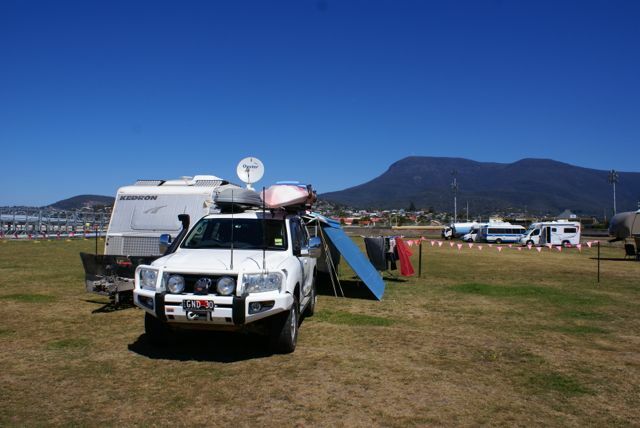 You have the choice of staying at the caravan park further up the road or camping near the beach. Glen also enjoyed a bit of fishing. $15 per night with drop toilets. No Ranger came to collect fees and no box to drop money off so our stay was actually free. Quite a nice, grassy van park near the mouth of the river. Glen had enjoyed some fishing while here. The van park advised of a fishing spot along the river. 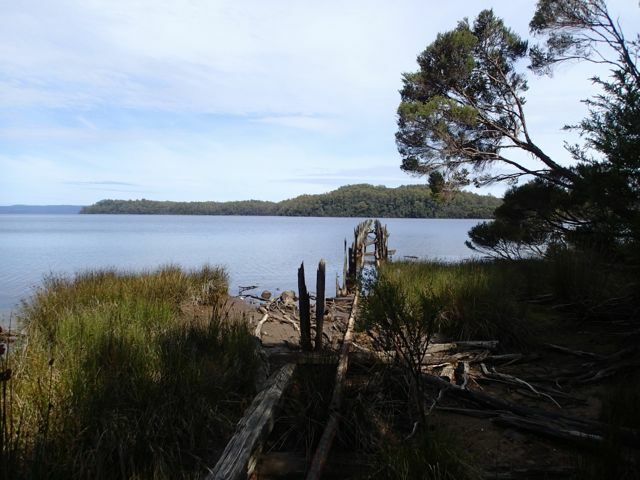 While he was at the fish cleaning station, he got talking to someone and recommended Millers Point and how we camped for free due to no-one collecting fees – it turned out he was the Ranger – whoops. He was all good about it😉. 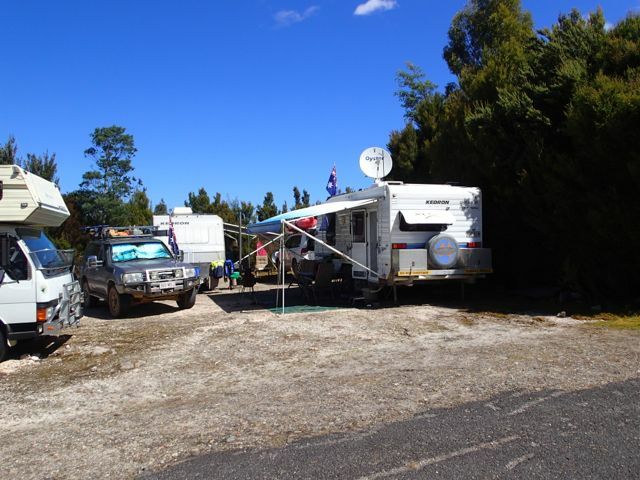 A free camp just west of Albany with toilets & dump point. There are 2 levels, the lower one right next to the beach, but completely shaded, so no go for solar. 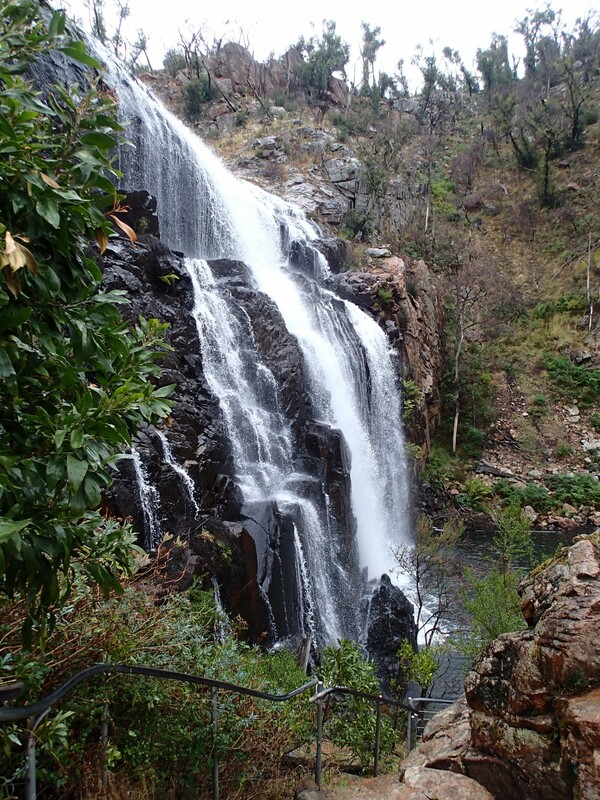 On 7th May we set off for Saddleworth CP nth of Adelaide. 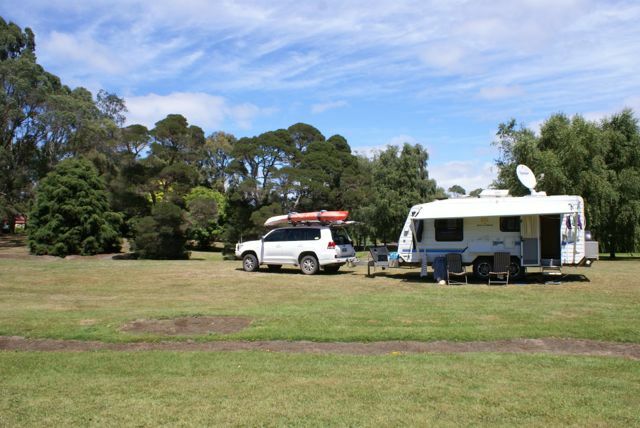 A community caravan park with toilets, showers and power for $20 per night. A few days later we made our way to Stockport CP to meet up with some fellow travellers that we met in Tassie, who lived in Adelaide. Unfortunately the area had had a fair bit of rain and the grounds were quite muddy, so we then moved onto the Clare Racecourse campground. A flat rate of $20 per night including power, water & toilets. We enjoyed four relaxing days catching up with Brigitta & Doug including revisiting one of our favourites at Clare, Knappstein winery & brewery. Just had to buy a carton of the reserve lager for our travels west. 16 May we set off for Western Australia stopping over at Murray Town, Iron Knob, Tcharkuldu Hill just outside of Minnipa and a great spot called Coorabie Farm west of Ceduna. $20 per night with all the facilities and the biggest fire pit setup we have ever seen. 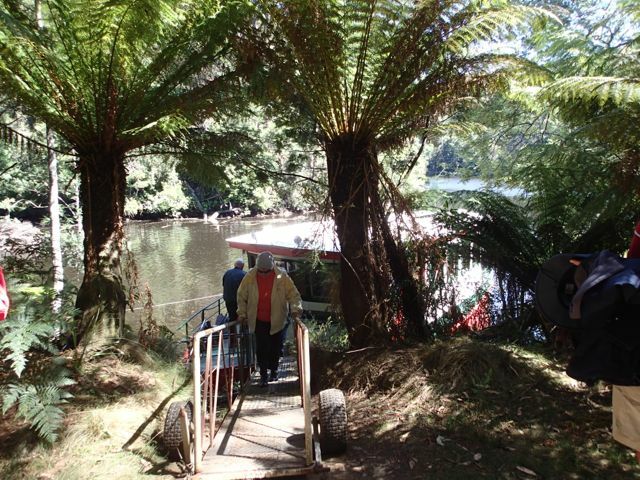 The owners took us on a tag along out to their fishing spot at Wandilla Bay. Only one big salmon was caught by one of the five in their car so not enough to feed everyone for dinner😕 From there we followed the coastline past Cape Nuyts, Mexican Hat & Scotts Bay before heading inland over the sand dunes and into Fowlers Bay. Quite an adventurous, enjoyable day. 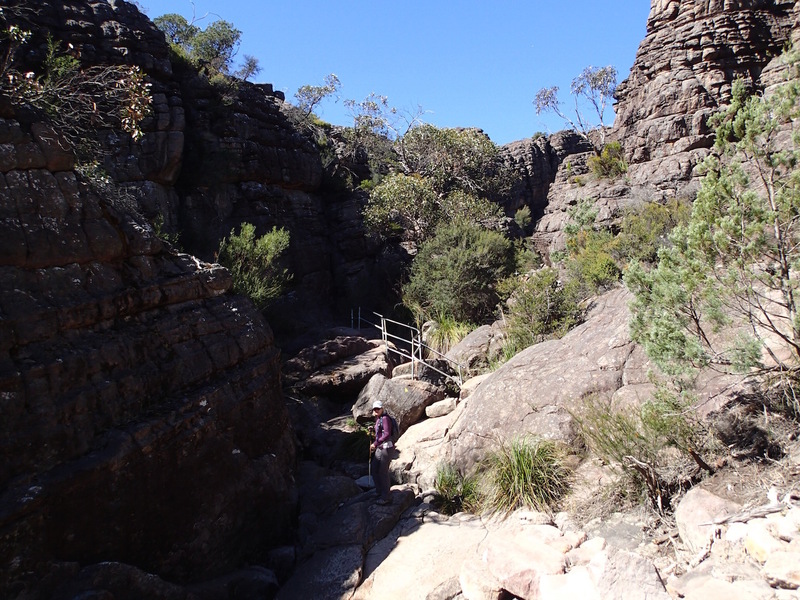 Our next stop was the Murrawijinie Caves campground, approx 11ks inland, north of the Nullabour Roadhouse. You can get a mud map from the roadhouse. As we were driving out into the middle of nowhere, we kept looking for some sign of a mountain of some kind where the caves could be. 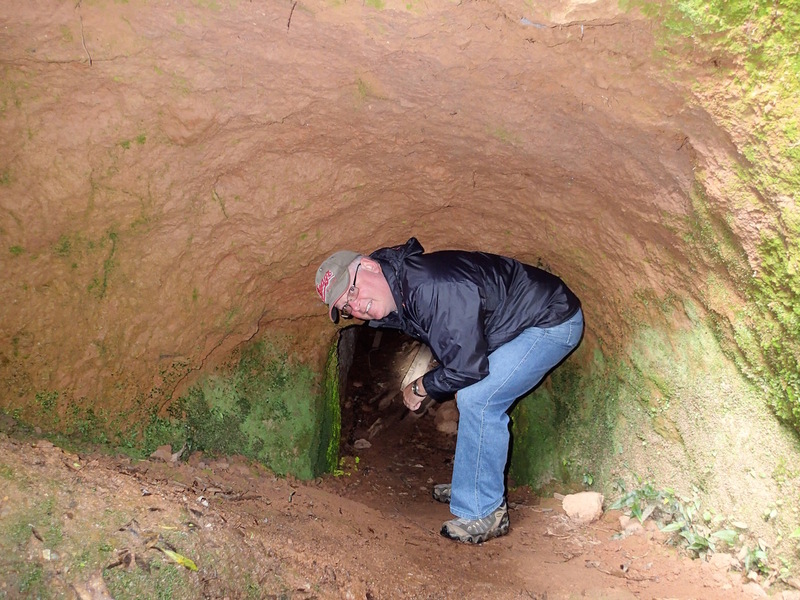 The 3 caves were underground and only one was easily accessible to explore. If you want to get away from everything, definitely the place to be and the stars were amazing. 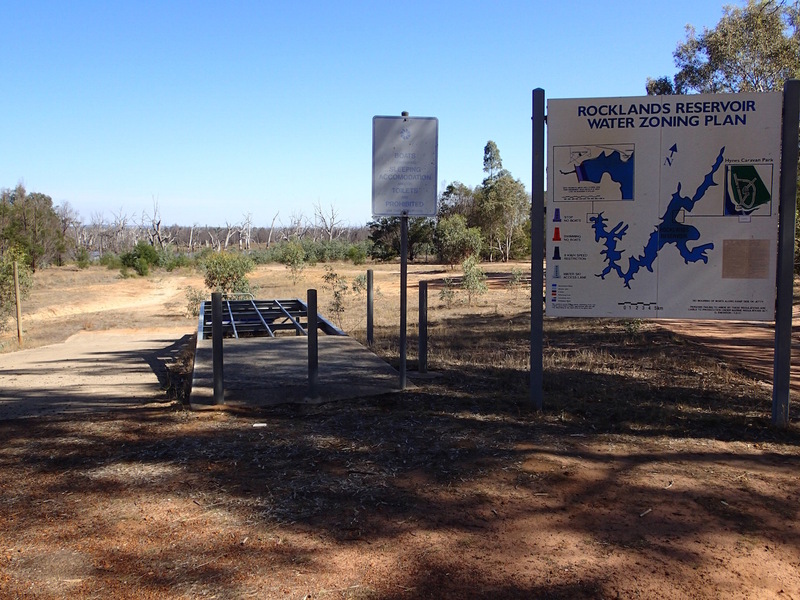 Our last great campsite at the end of the Nullabour was next to a watering hole at Newman Rock. We had visits from the emus and a camel who eventually decided Sammy was of no concern. Not sure what sammy made of him. This was quite a rushed trip for us especially after being used to travelling approx 90ks to get from one camp to another in Tassie, but halfway across the nullabour realised we needed to put a bit more mileage in each travelling day if we were going to reach Western Australia in enough time to allow some sightseeing before making our way to our care taking duties at Porongurup Range Tourist Park on 1 July 2015. 27-28.5.15 Newman Rock, camel checking out Sammy on its way to the waterhole. Well it has been quite a while since we have updated our blog. 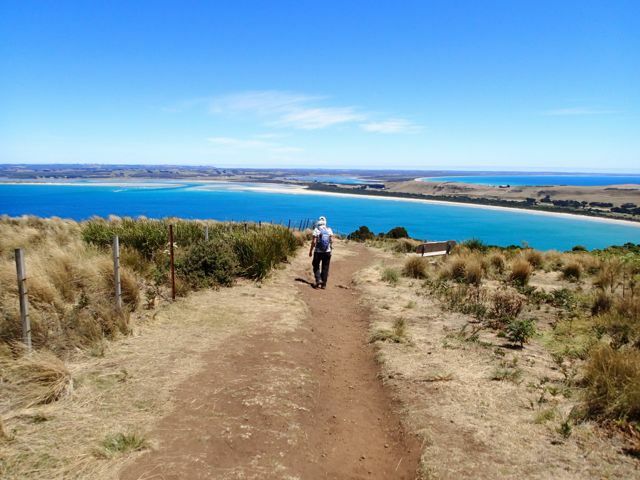 Partly due to lack of Internet and doing a couple of months work – well not sure if we can call it work as we met some lovely people and stayed in one of the most stunning areas of WA. 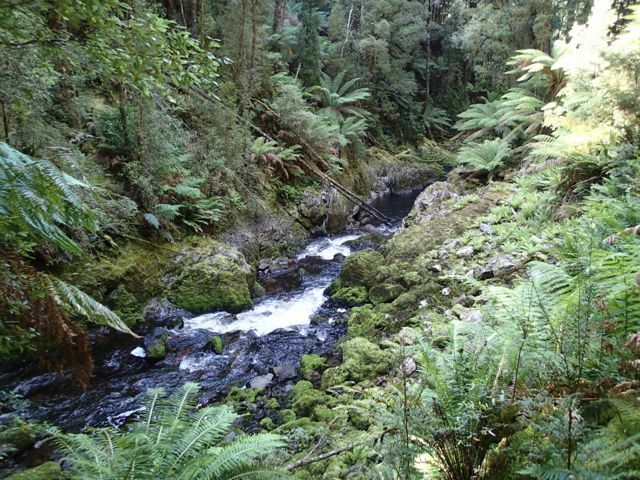 So continuing on with our Tassie travels. 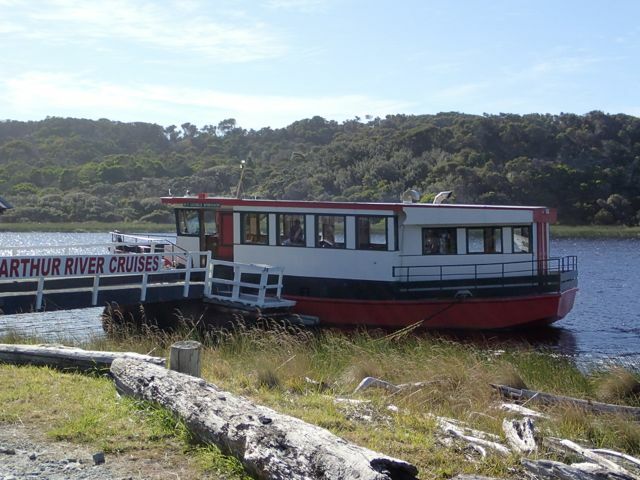 After our stay at Sunset Beach we headed over to explore the towns and sights either side of the Huon River. 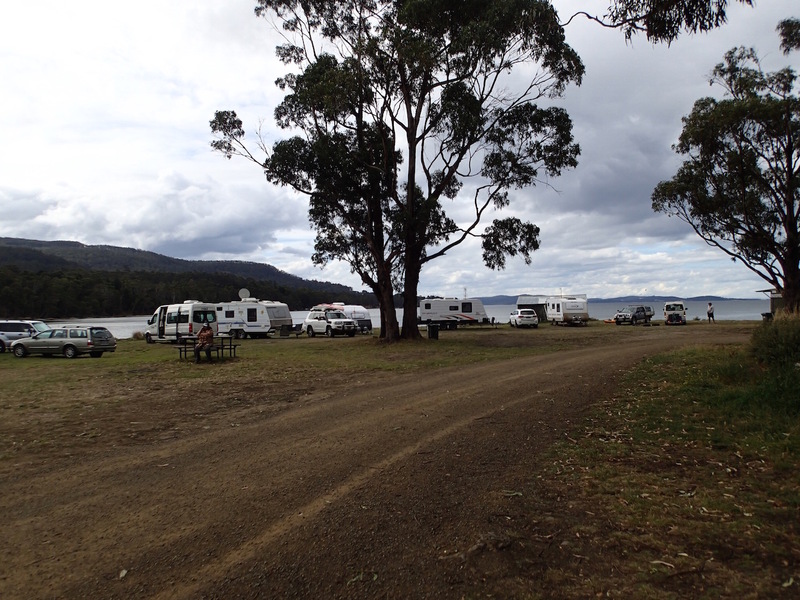 Our first stop over was at Gordon Recreation Reserve which looked across to Bruny Island. 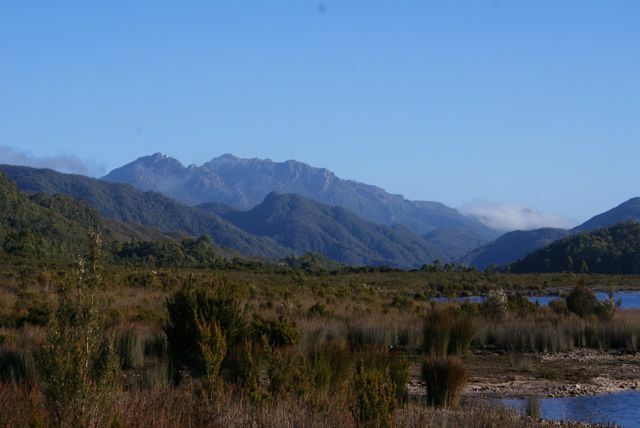 From here we were able to check out Grand Vewe Sheep Cheesery at Birch’s Bay which was quite a hardship tasting cheese, having a coffee made on sheep’s milk, lunch and a pat of the sheep. Then onto Gardners Bay, Eggs & Bacon Bay, Verona Sands and back to Gordon. So much realestate with waterfront views. 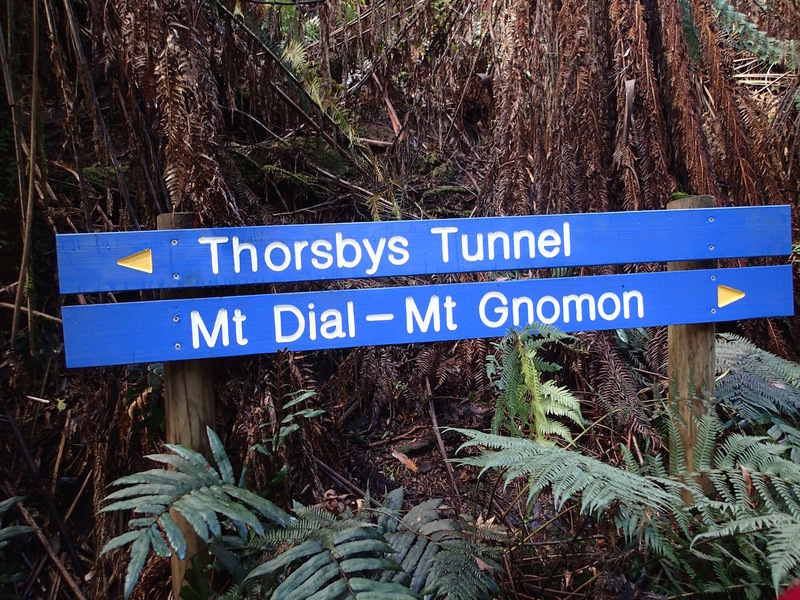 It would be very tempting to buy somewhere on Tassie. We finished our stay in Tassie at the Blue Wren Tea Gardens which is a few ks west of Ulverstone. We watched over the campground while the owners Vicki & Trevor were having a well earned holiday overseas and their house sitters needed to return to Melbourne a few days before they were due back. Apart from watching over the campground, we also enjoyed the fresh eggs collected each day and fed the cats. 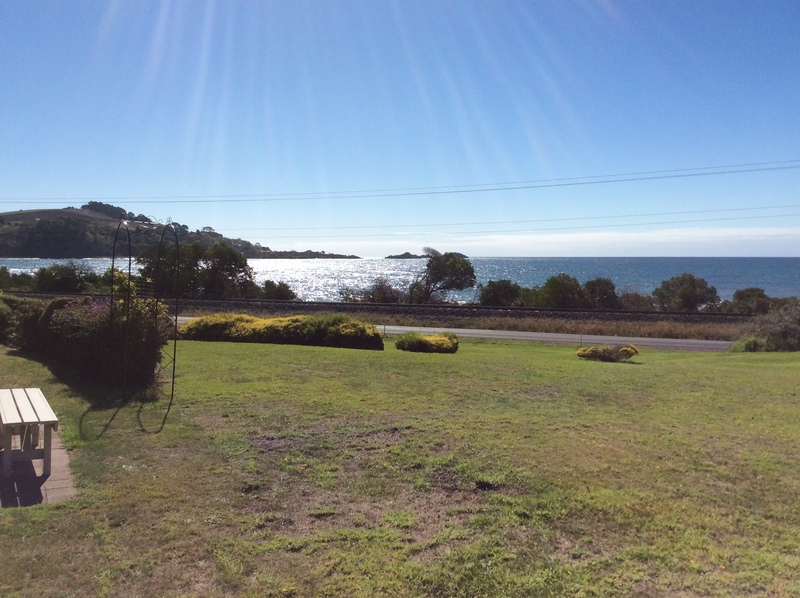 What a beautiful campground, right across the road from the beach & penguins. Not that I got to see any penguins😔 but Sammy came across one amongst the bushes and it soon told Sammy where to go in no uncertain terms. But I just loved sitting in the afternoons, watching the ocean – heaven. 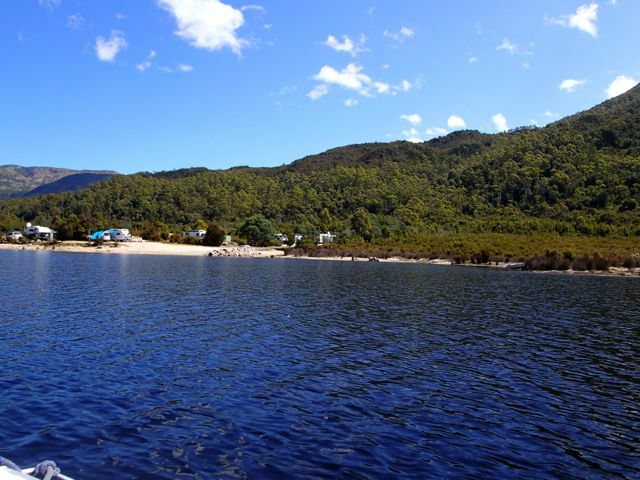 A great spot to spend either your first or last few days on Tassie. A short trip from here to the Spirit of Tasmania at Devonport. 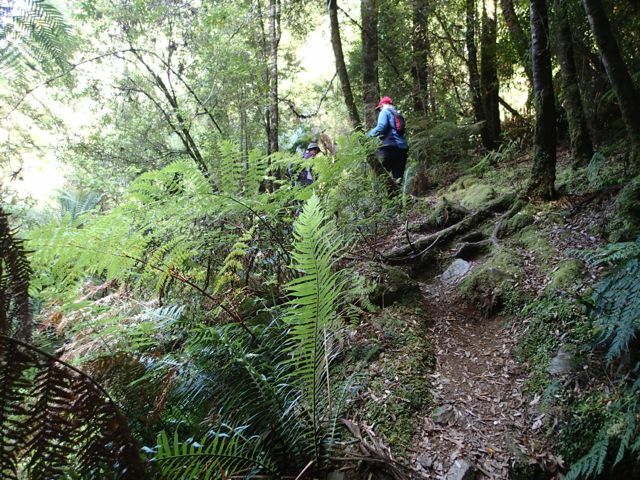 It also gave us the opportunity to check out Mount Dial Nature Recreation Area taking in the Ferndene State Reserve, a short distance from Penguin. Sadly, we arrived in Melbourne the morning of the 30 March and was booked into Five Ways CP I actually had a pretty good crossing at long last – drugs are good. Dometic had arranged for us to have our hot water system and heater to be checked later that day. 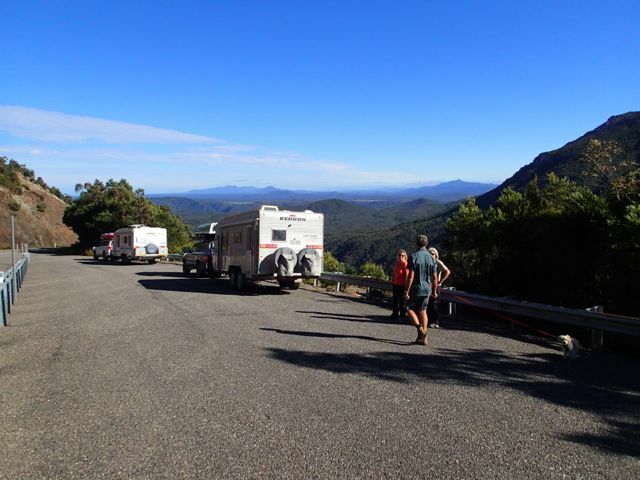 A couple of days later we hit the road out of Melbourne with a new hot water system and minor adjustments to the heater. Our next stop was Smythesdale Public Gardens, Sth west of Ballarat. A great camp spot with facilites for a donation. Quite a large area, but of course the next morning a couple of Motorhomers with large buses and trailers decided to park right next to us, right outside our door😡 Of course I very nicely informed them that that was ok to park right on top of us considering the size of the campground and of course not to move as we would move to an entirely different campground. 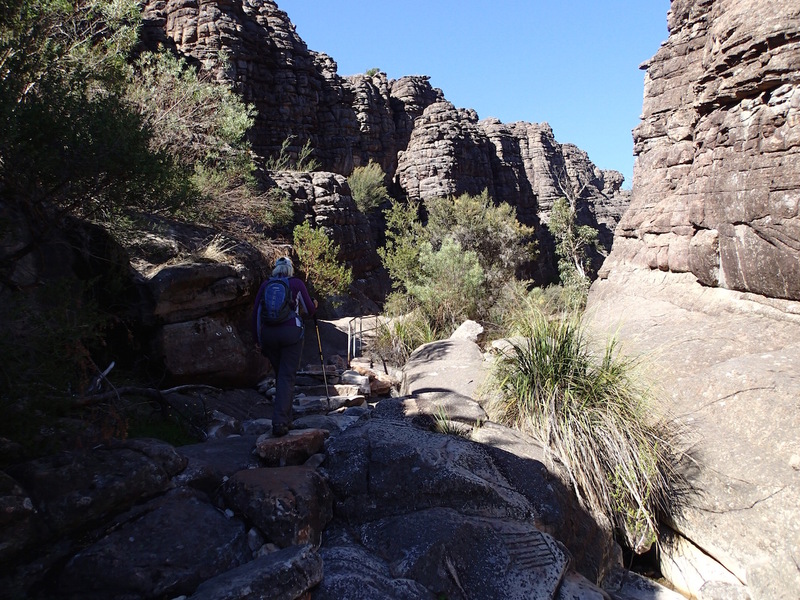 We ended up at Hynes Camping Reserve on the western side of the Grampians. What a great little spot for $15 per night on power. 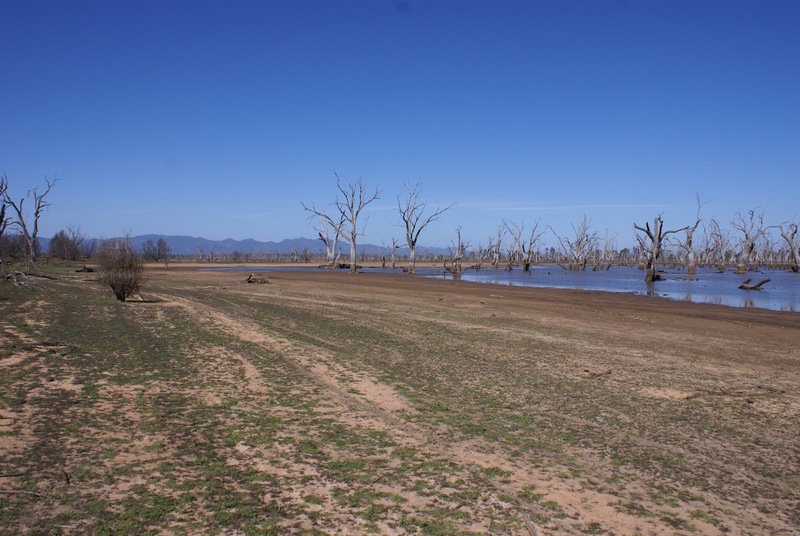 It sits on the edge of Rocklands Reservoir which hasn’t seen water for a very long time. They have what looks like a fairly new boat ramp which isn’t anywhere near what little water is still there. 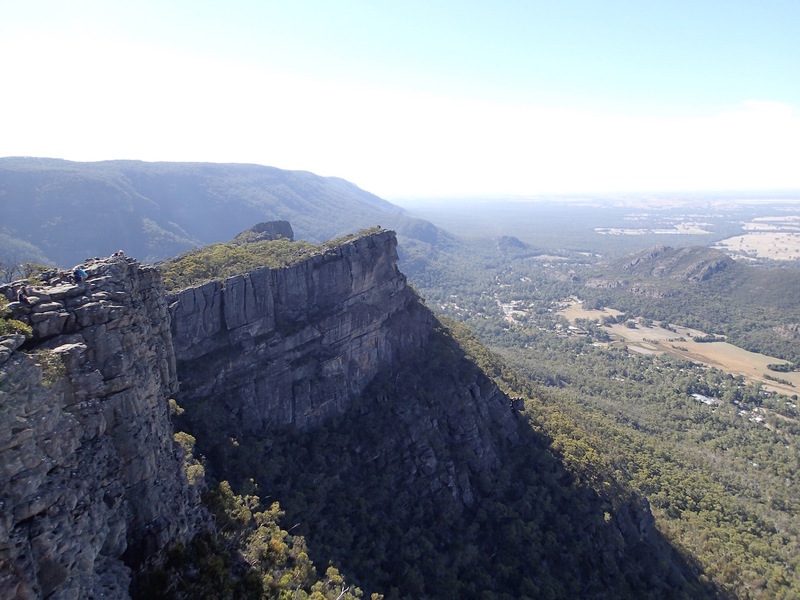 Even though it was Easter, it was a big enough area to not feel crowded unlike Halls Gap where they were camped on top of each other. We amused ourselves by doing the Pinnacles 5.5k circuit. 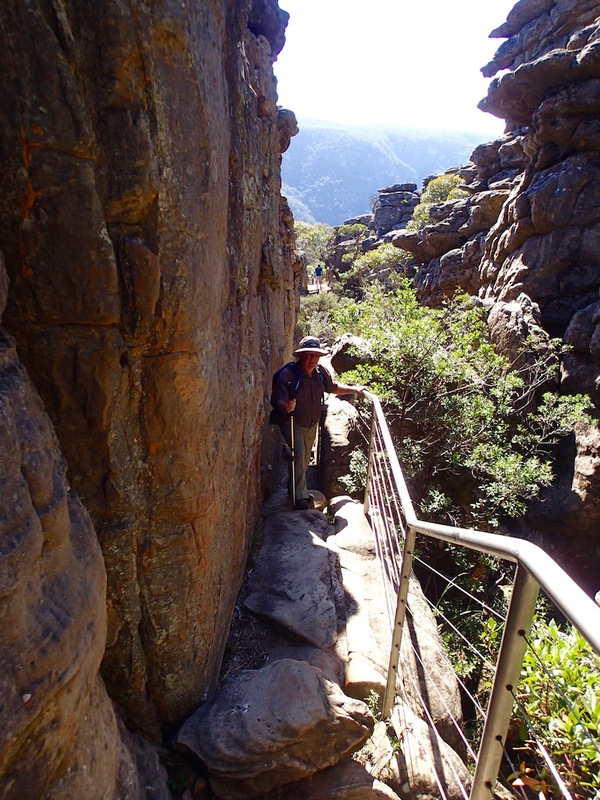 “A more challenging walk departs from the aptly named Wonderland carpark and ascends via the impressive Grand Canyon. 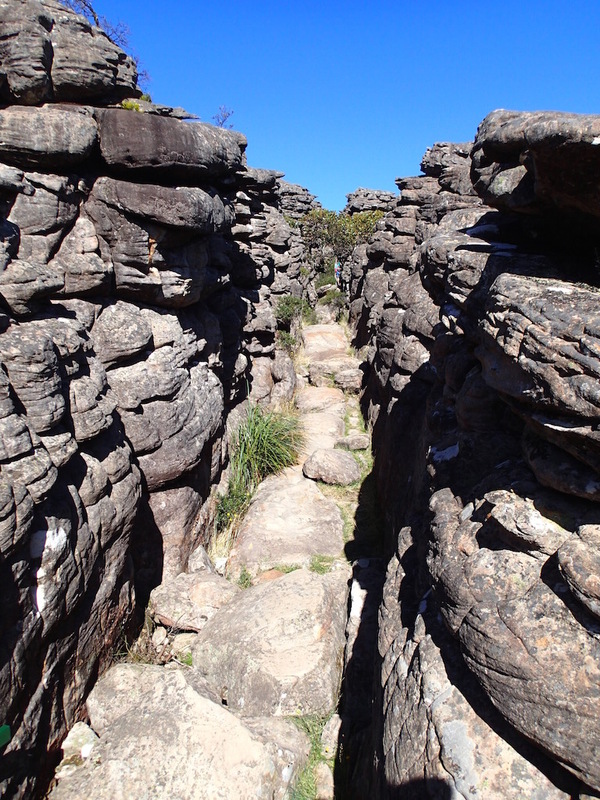 It does not resemble the American canyon of the same name but is equally impressive with its unique Australian rock formations, albeit on a smaller scale! 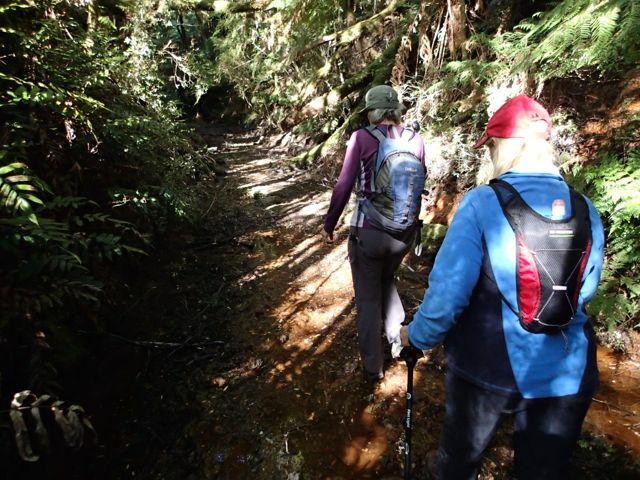 The walk continues through the Silent Street before rising up to The Pinnacle.” At least half was downhill, but the uphill was quite a workout especially for the one with buggered knees😉 A couple of days later we did the walk to MacKenzie Falls and part of the falls river walk. Very enjoyable even in the rain. Our next stop was Horsham Showgrounds, then onto Bolto Reserve at Mannum and arriving at Chris & Val’s at Springton on 9 April as I was booked to fly to Brisbane from Adelaide the afternoon of the 10th for a specialist appointment on 13th April. It was good to catch up and spend my birthday with our daughter – very special. I also enjoyed catching up with some family and friends. Meanwhile Chris & Val were keeping Glen occupied with some geocaching, food tasting, etc. 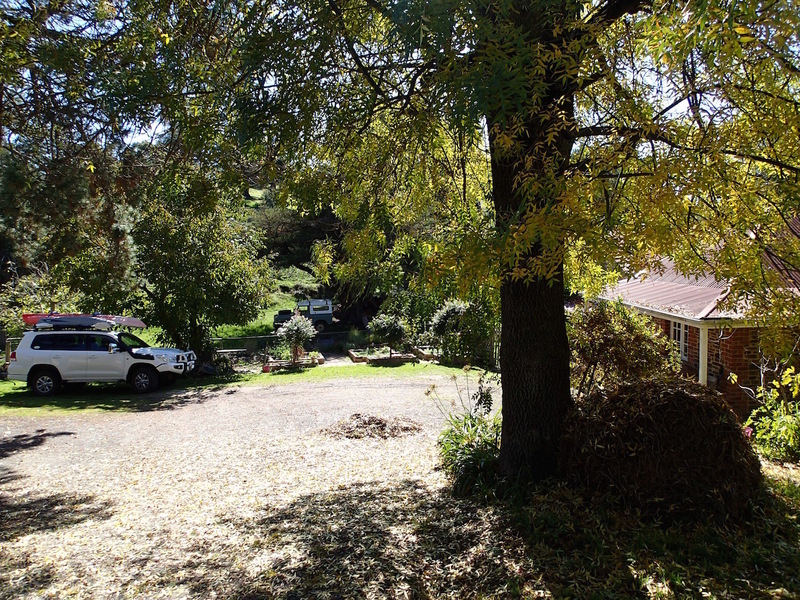 I arrived back in Adelaide on the 15th and we moved on from Chris and Val’s on the 18th to start our house sit situated halfway between Lobelthal and Gumeracha until 6th May. The owners of the house, Peter & Rosie were flying overseas to attend their daughters wedding. The house sit included looking after their short haired German Pointer, Tildy. Tildy and Sammy had a ball and helped to keep us fit with a few ks of walks each day. Their house was approx 163 years old. 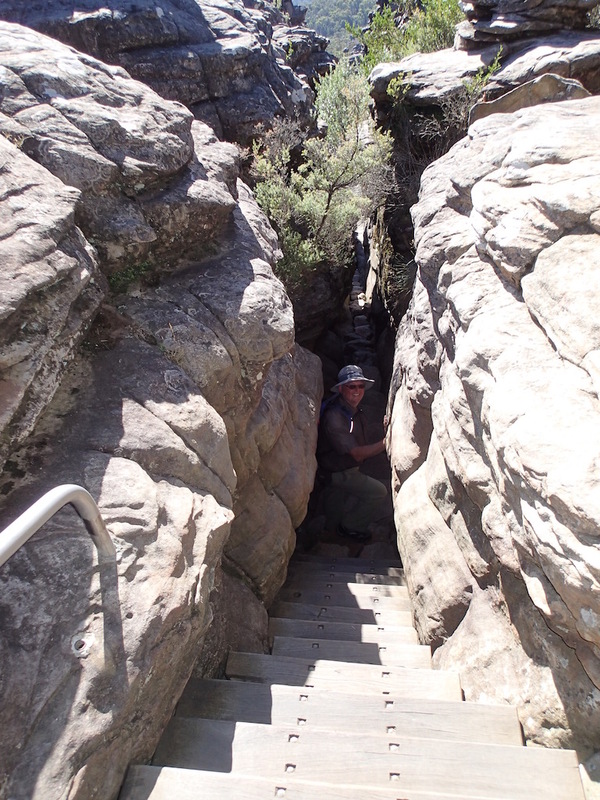 Some of the doorways were quite low and Glen had to duck to walk through. On Anzac Day we attended the morning service at Gumeracha. The number of people who attended was mind blowing for such a small community. 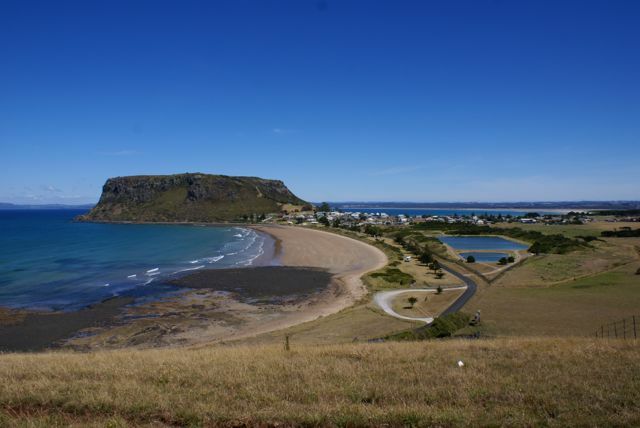 We moved on to Stanley on Sunday the first and set up in the camp opposite the showgrounds which is $8 per night and an easy walk into town. We joined in happy hour with fellow campers and shared heaps of advice with them on what to see and do, as they had just arrived from the mainland. One couple was from the Gold Coast and the other from Perth. 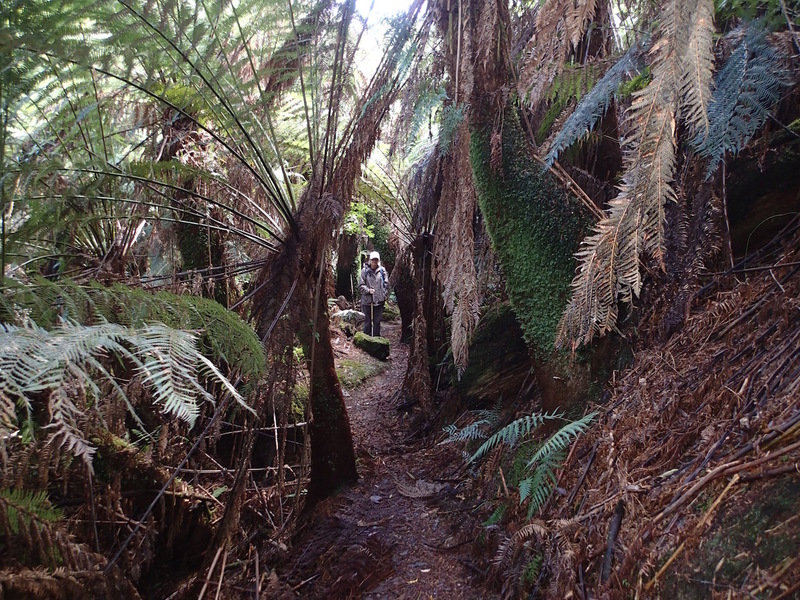 We spent the next day walking up and around The Nut, which has the steepest grade of walk up a bitumen path I’ve seen anywhere. It also seems to be a lot harder than it did 6 years ago, but that’s just what getting older does to you I suppose. 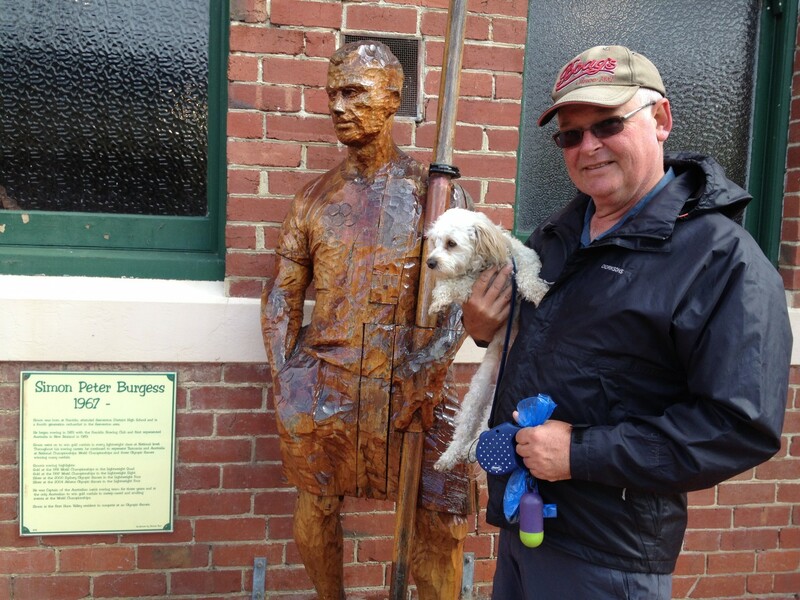 We also completed a few caches here, then moved on to Smithton free camp on Tuesday. This was just an overnight stop on a few grassy acres beside a small stream provided by the Hotel/Resort. 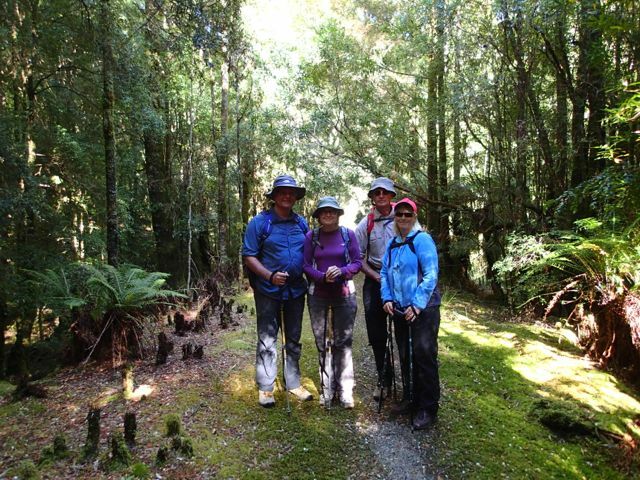 Ok for one night and then we moved on to Arthur River and once again met up with Geoff & Joy Burgess & their Scottish friends. They had booked on the Arthur River cruise for the next day, so we shot down to the store and booked ourselves on as well. A great happy hour was had as usual. This is an excellent camp with fairly new flushing toilets and fire pits scattered about. We boarded the boat and were welcomed by both the new & the previous owners. 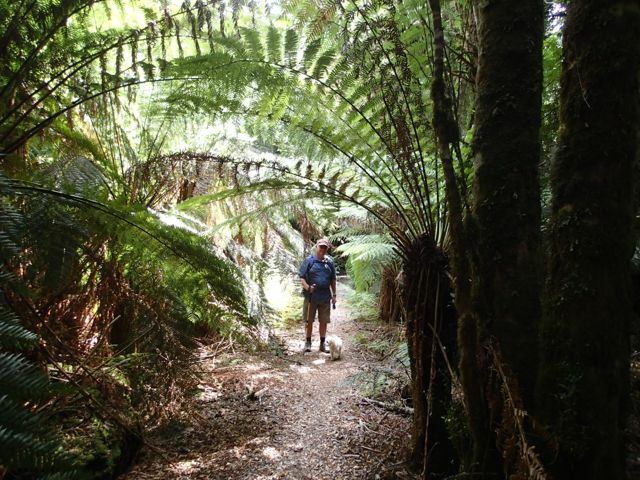 The weather Gods were shining down on us, as it was a very pleasant day and you are always pretty sheltered from the winds upstream amongst the rainforest. We cruised for a short time with some great facts and history of the area being provided by both of these characters, who obviously enjoy what they do. 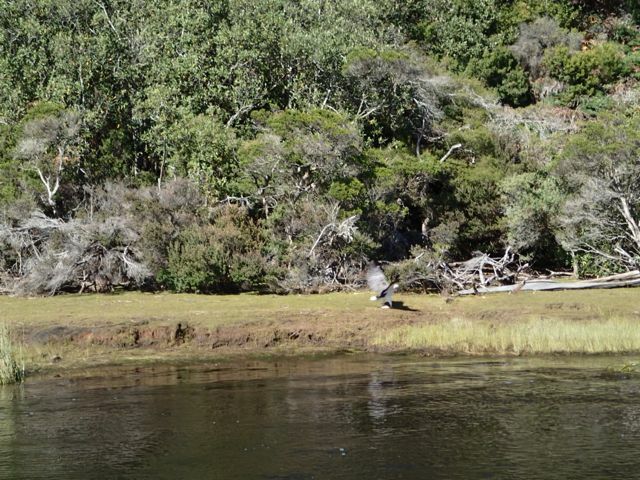 We soon came to a spot where they feed a couple of sea eagles with whole fish thrown up onto the bank. I was lucky enough to snap a shot of one as it grabbed the fish, although not perfectly focused. As we were getting close to the lunch destination we first had to pass over a shallow sand bar and just our luck, it bottomed out and we were stuck well and truly. We thought we would have to wait for the other cruise boat to come and give us a tow, but after many attempts at rocking the boat back & forth & side to side it finally moved forward and on to our lunch mooring in the forest. 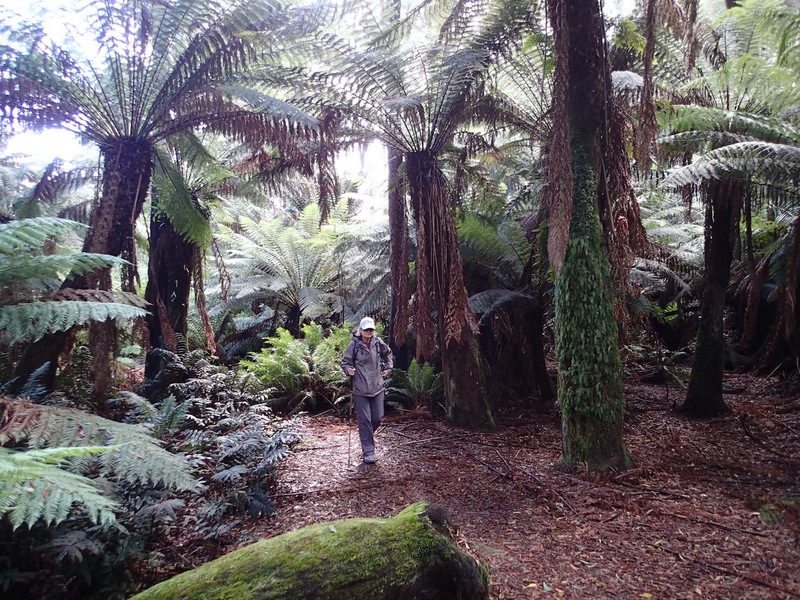 One of them gave us a guided walk through the forest describing many of the trees and plants along the way. 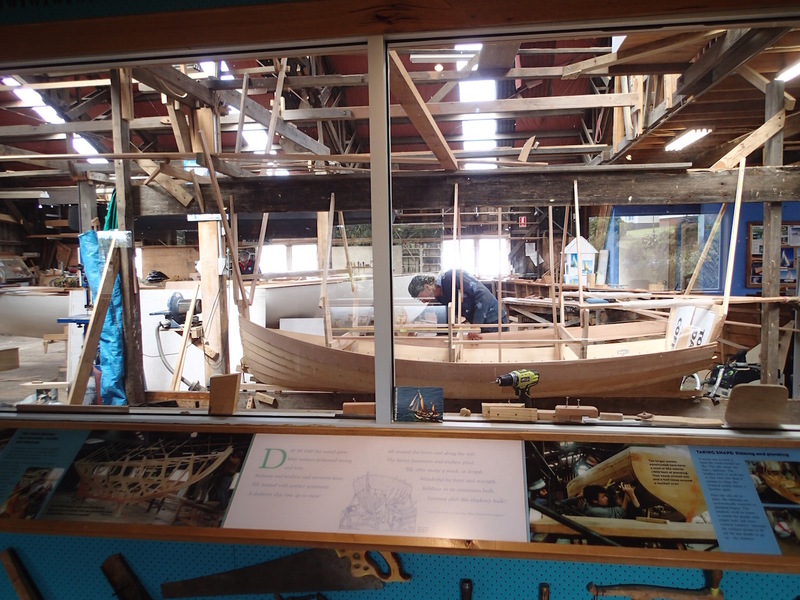 He was once the owner of a sawmill so he had an extensive knowledge & experience on the subject. His mate prepared a fantastic BBQ’d lunch while we were gone and we even had some wine thrown in to wash it down. 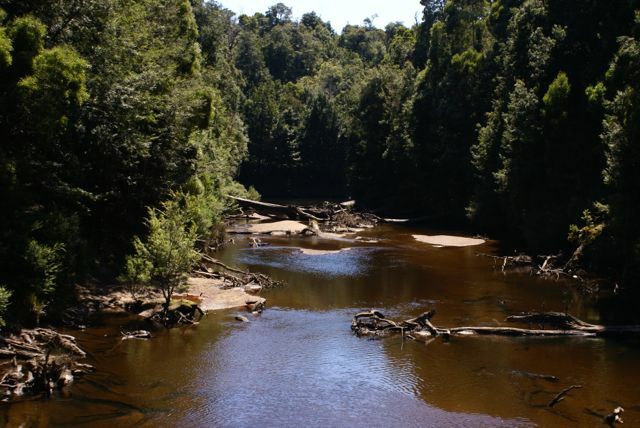 All in all, a fantastic and informative day on the Arthur River. 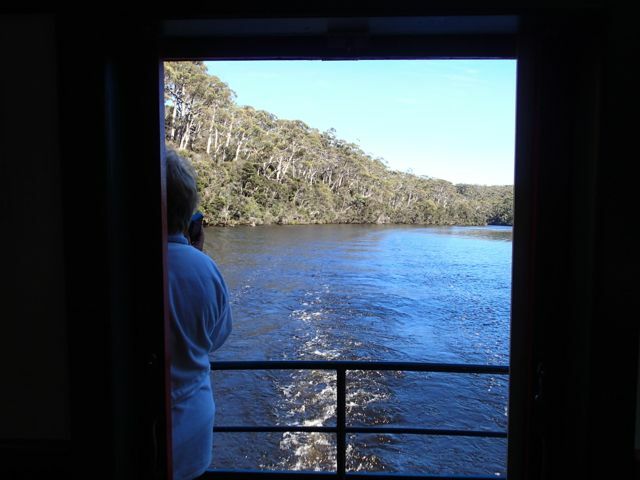 After two nights here we headed south down the western explorer towards Corinna on the Pieman River. 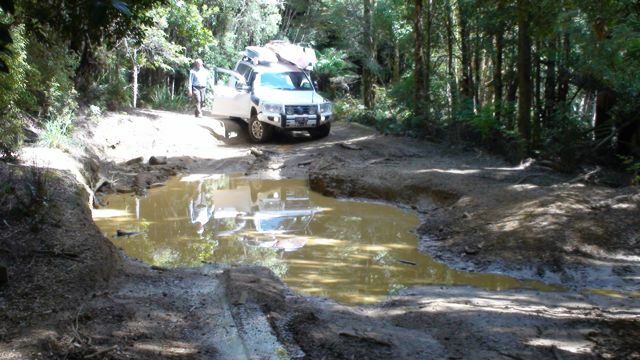 Geoff & Joy and friends went around by the bitumen and down to Strahan as their friends only had an on road van. We let our tyres down and took it fairly easy as the road was a little rough and loose in sections. Surprisingly the countryside was quite mountainous as I had, for some reason, pictured this section as fairly flat and scrubby. It was an enjoyable drive as we only passed a couple of other vehicles along the way. One section had warning signs advising of a short very steep climb ahead, so I put the transmission in low range and thank God I did! Pulling 3.5t of van up the section certainly put everything to the test. We later heard of one person who ignored the warning, got half way up with his Bushtracker van and couldn’t make it. The car slid back and jack-knifed into the van. He got out using his low range, but it would have been quite frightening during the slide back. Once at Corinna we found there was no suitable camp and as we had expected our rig was too long to go on the Fatman Ferry to cross the river. 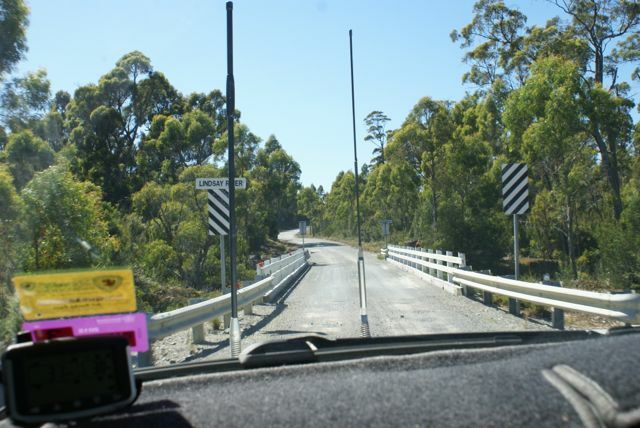 So we headed northeast and on to Waratah which was our planned destination. We stayed at the council park on the banks of a lake right in the middle of town. 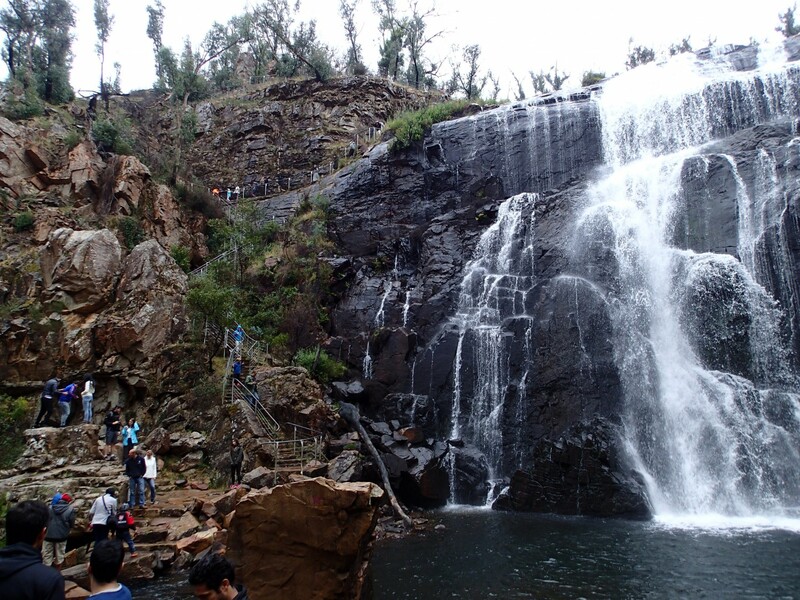 It’s one of the few towns built around a huge waterfall that had been used to run a large mining structure which was built right over the falls. Like many towns it is considerably downsized from what was here in the early days, but the mining is still going ahead in the hills. The next day we drove back towards Corinna about 10klms to walk down to Philosophers Falls. 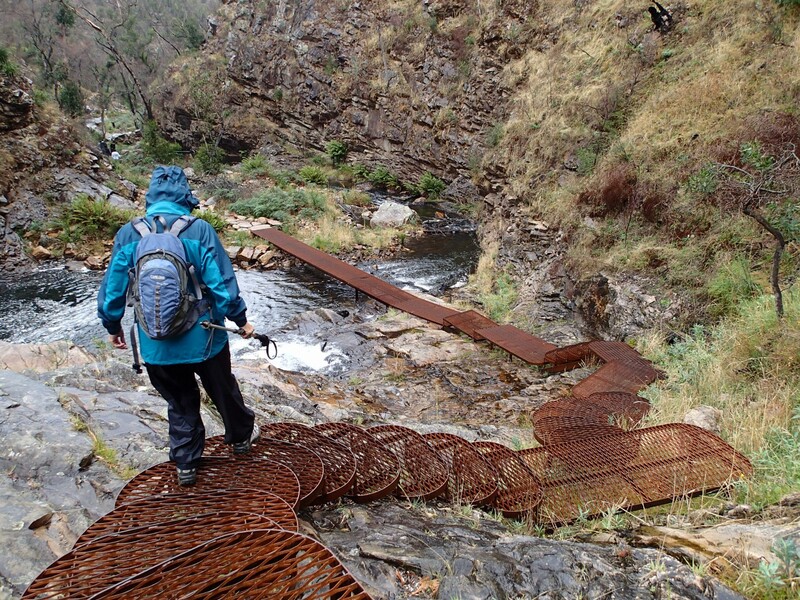 This was another amazing walk which followed along the edge of a stone water race which was amazingly built by hand to convey water to the nearby Magnet Mine which closed in 1940. 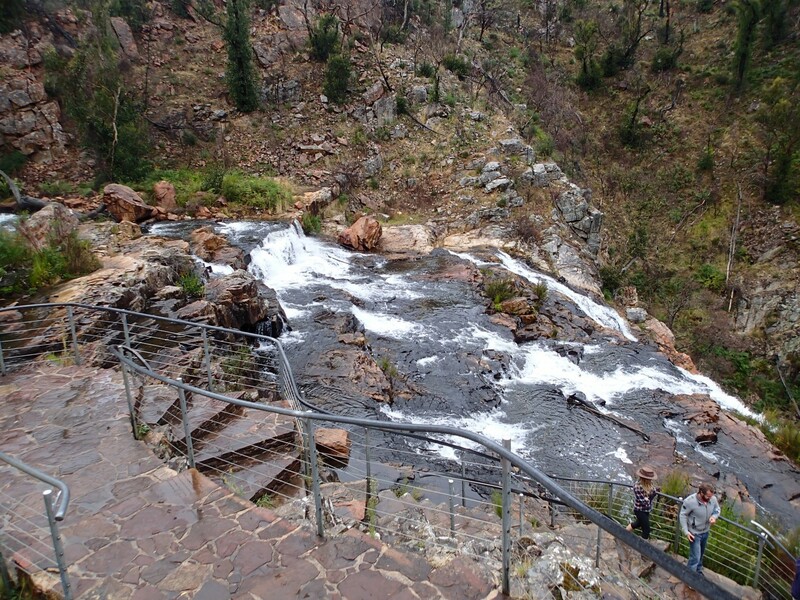 There’s a set of 200 steel steps down to a viewing platform at the end giving you a great view of the top of the falls. 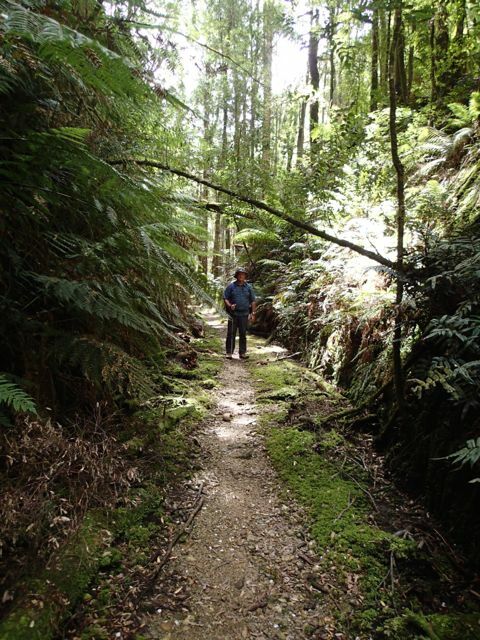 It’s incredible to think that all this existing forest is actually regrowth but it looks quite natural and like most other forests in Tassie covered in green moss. 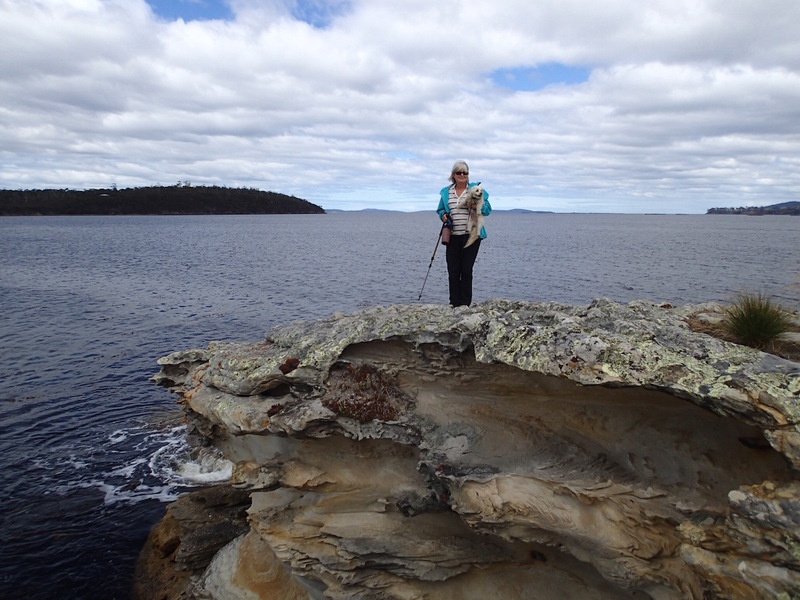 After two nights in Waratah we went south via Zeehan, through Strahan and out to Macquarie Heads, the mouth of the massive Macquarie Harbour. The road out to the Heads was rough & stoney gravel, which is in contrast to most of the roads in Tassie that are in quite good condition. We found Laurie & Helen and set up camp beside them with the intention of doing some fishing while we were here. But it was very windy on the beach and the current was ripping through the heads with lots of weed in the water. We had a great camp behind the foreshore trees that completely blocked the wind out so the pig was lit & happy hour rolled on. 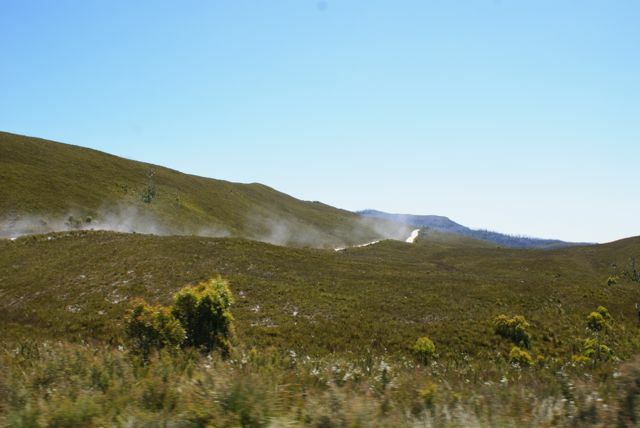 The next day we went for a drive to Montezuma Falls via Zeehan which was about a 40 minute drive to the start of the 4wd track. This is one I’ve heard about and been wanting to do since we were here last time. Don’t be fooled by the sign at the start that says 2 hrs return as it took us closer to 6 all up. It didn’t help that we had a kayak and a boat on top as there were quite a few low branches that got a nudge on the way. 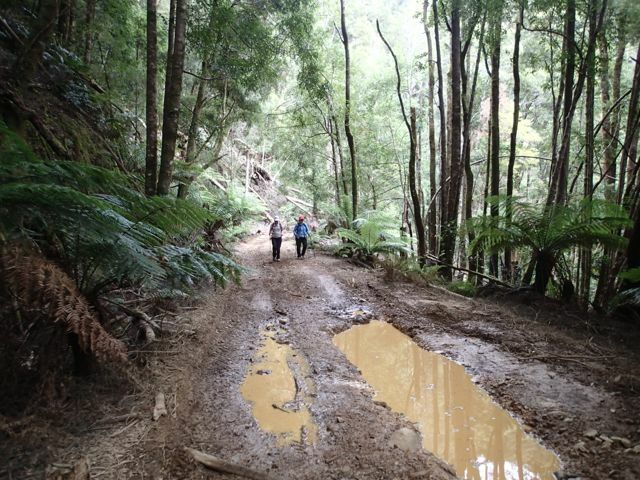 This track follows an old rail line that is very narrow, rough & boggy in places. We often had to pull our mirrors in as it was that narrow. Low range was the gear of choice, with great care taken not to scrape the edges or bash something in a bog hole. It was fortunate that we didn’t meet any cars coming the other way as there was simply nowhere to move over nearly all the way. We did meet a group of locals on quad bikes that managed to back up for us and reckoned we could get through to the end of the falls. 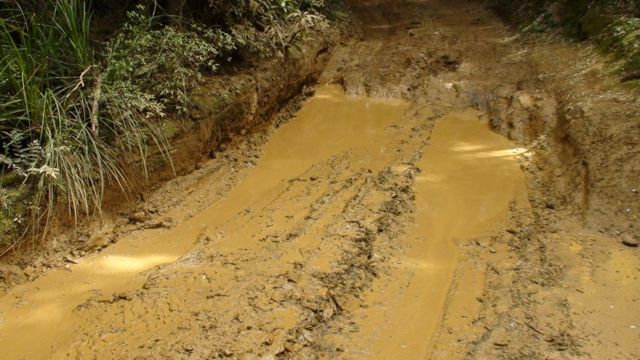 There was one washout on a hairpin bend that we had to scrabble up that got the heart racing and then, fortunately we met two vehicles that had stopped for lunch. 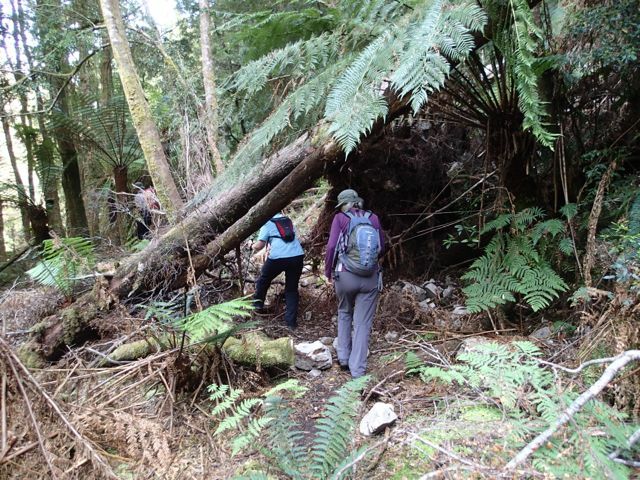 They advised the next washout was quite difficult and as it was only 3.5klms to the falls, we decided to walk rather than risk any damage or getting stuck out in the bush. If we didn’t have all the gear on top we would likely have made it unscathed but as it turned out there were several large trees hanging low across the track that would have stopped us anyway. 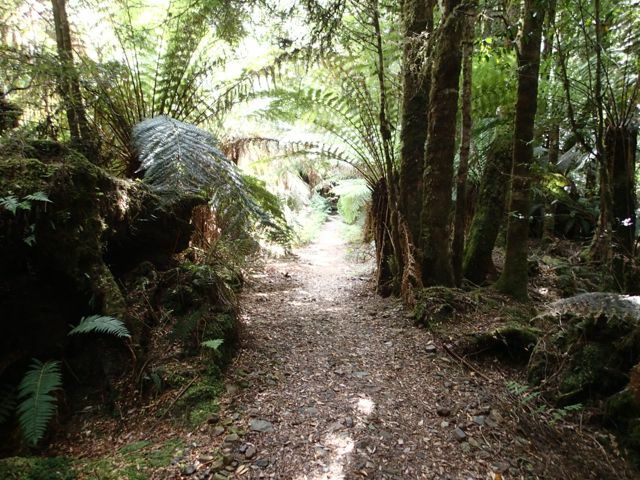 The walk was enjoyable as being an old rail line it had only minimal incline. 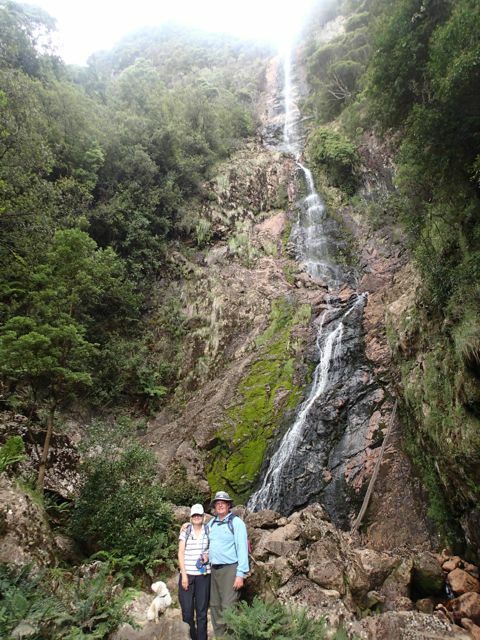 We stopped for a snack at the start of the walking track before walking the last 400m into the falls. 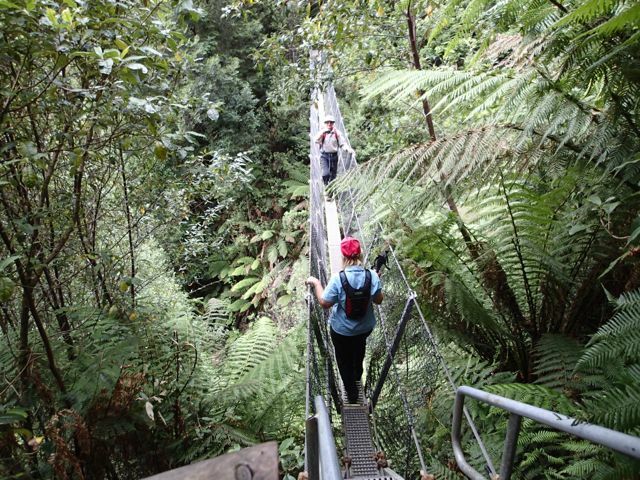 Just before we got to the falls we had to cross a suspension bridge that was quite narrow and easily got a bounce up. I had to carry Sammy across as it was quite a drop to the river below. We made our way back out and re-inflated our tyres before heading back. 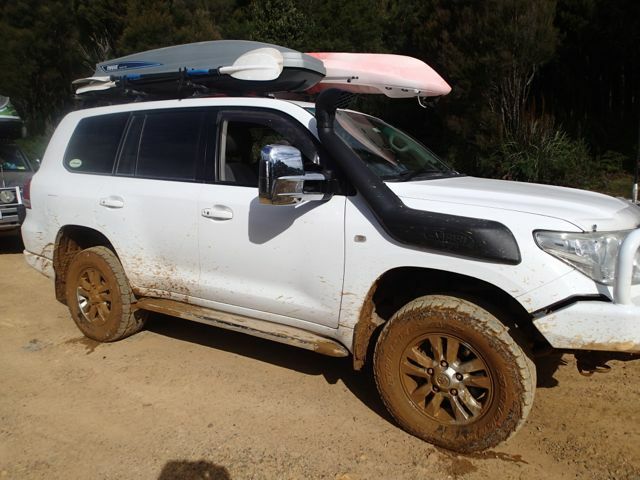 We also now had orange mud on the cars and on our trouser legs, which a young boy spotted when we stopped at Zeehan pub for a late lunch. 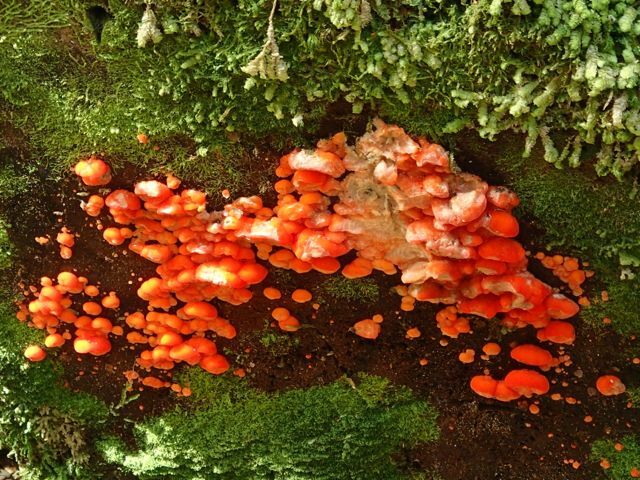 He said “you’ve been up to Montezuma Falls haven’t you?” Clever kid!! The next day we left Strahan and drove up the range to Queenstown, did a shop and headed out to the southern end of Lake Burbury near Darwin Dam. From Queenstown we had to climb up a very steep range for several kilometres and stopped at the lookout just over the crest. Wow!!! What a view. This country is spectacular and photos just don’t do it justice. We then had to descend down to the dam in first gear with gentle application of the brakes to try and avoid overheating them. It had a small camp area that used to be the construction site when they built the dam and a boat ramp was on the side. What a fantastic time we had here, the locals camped beside us made us feel very welcome and the scenery was to die for. These guys are all fly fishers and had many years of experience so we managed to get some tips off them before we left. I got to catch my first rainbow trout and Laurie caught a couple of good sized brown trout. They were fantastic eating and I’m sure it has something to do with the pristine waters they were caught in. 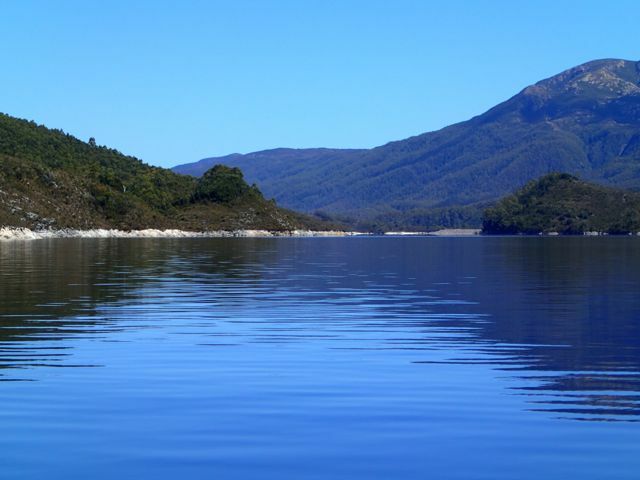 That’s what’s so special about Tassie, the water’s crystal clear and the air is the cleanest in the world. We went for a drive further down the road for about 14klms and turned into another old rail track, but this one has been maintained and is in good condition. 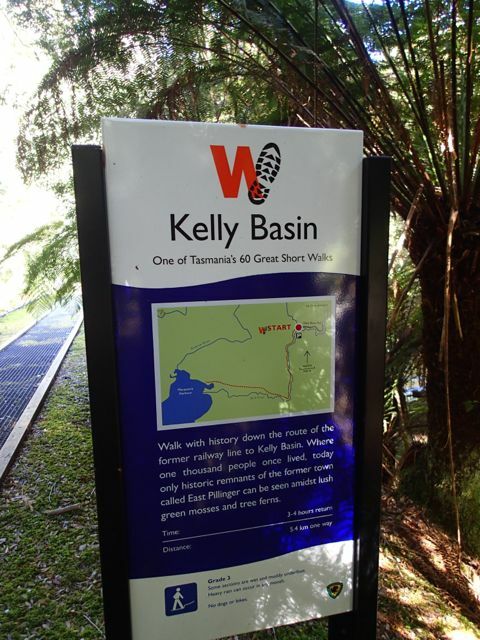 Once in the parking area we donned our backpacks and headed off on a 15klm return walk into Kelly’s Basin. There’s not a lot of maintenance done on this section of the track and requires some climbing over rocks, logs and negotiating bog holes. 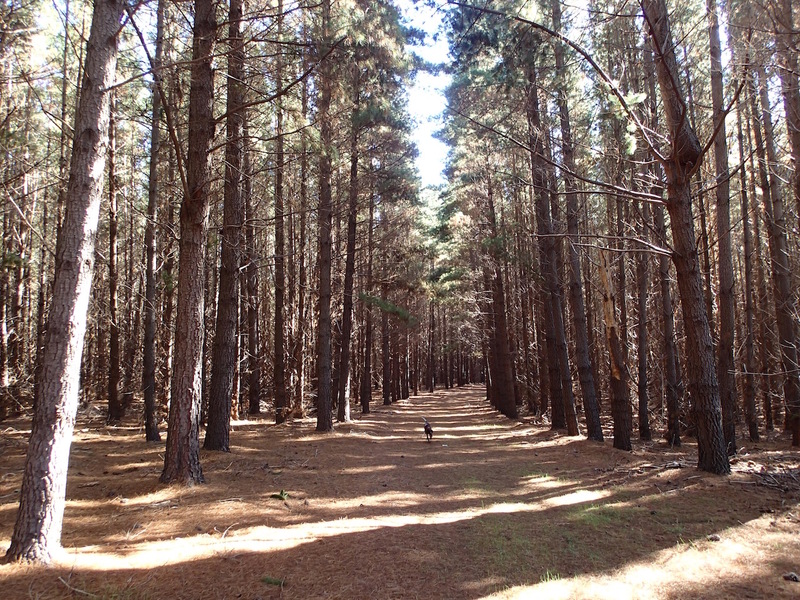 This track follows the river most of the way until you near the old township site. 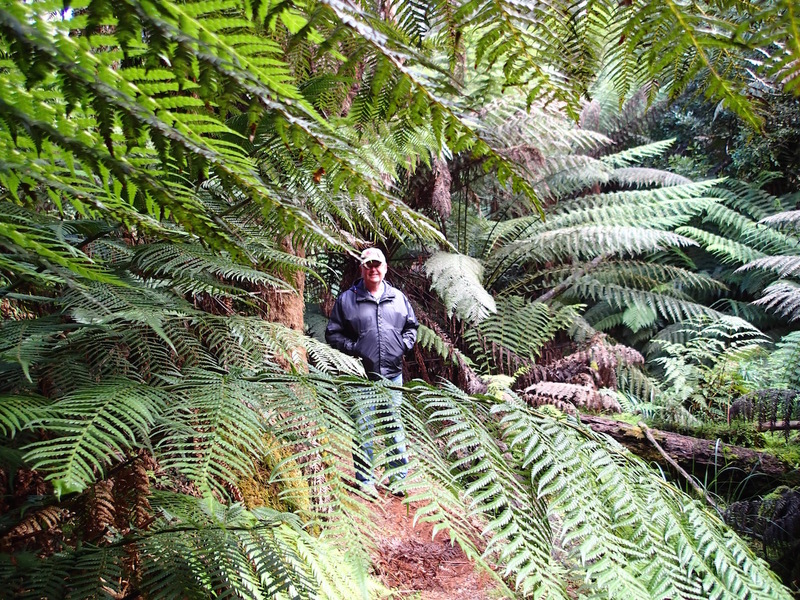 Once again we’re in thick rainforest with ferns and moss everywhere, so a constant watch for tiger snakes was required. It’s hard to believe that about 80 years ago there was a full on town here. 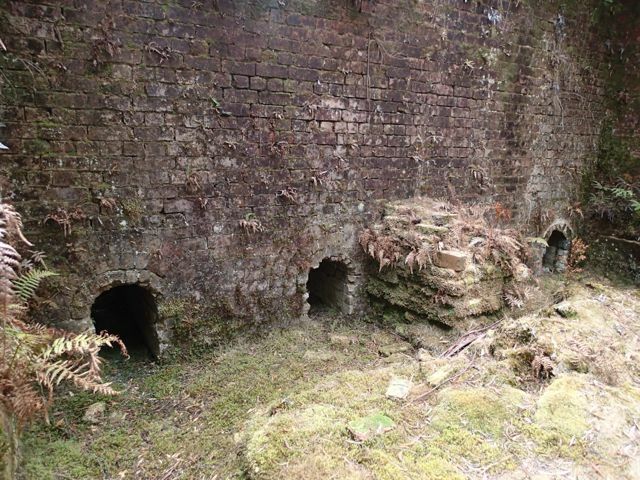 The bush has regrown and other than a few kilns from the old brick works and a couple of boiler tanks, you wouldn’t know it. There’s also remnants of an old jetty that carried the bricks and tourists on rail carriages to the transport ships. After a week in this paradise we decided it was time to move on. 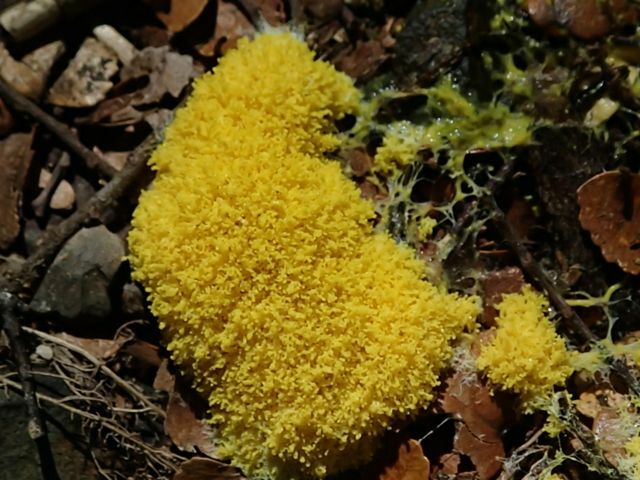 I have to say the only drawback was the horse flies during the day that could bite and draw blood, leaving you with a painful site for several days. We had to go back through Queenstown in order to head east, so it was up and over that huge range again. I think new oil in the transmission and new brake pads will be in order when we get back to the mainland. 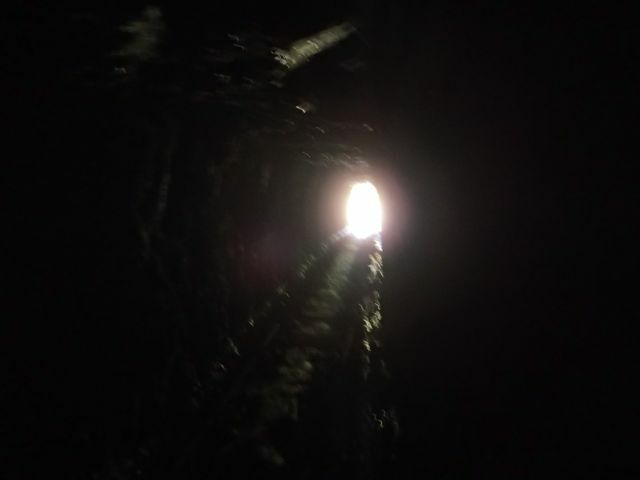 At the top of the range I explored an old miners tunnel that went back about 150m into the hillside. At the very end someone had placed an old bathroom vanity, complete with toilet roll. Quirky!! Thankfully no-one had used it. 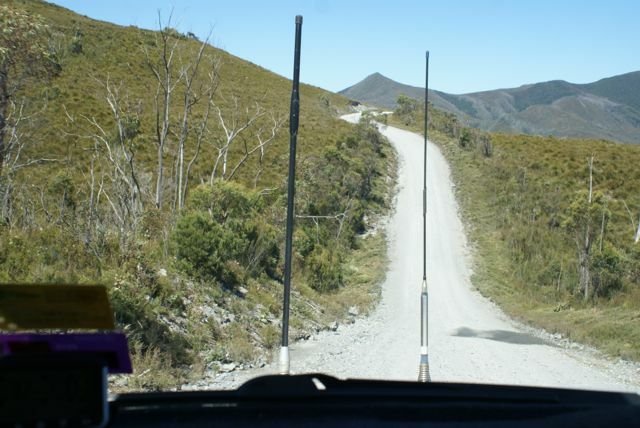 The range heading towards Hobart out of Queenstown is feared by many people as they say it’s very steep with tight hairpin bends. 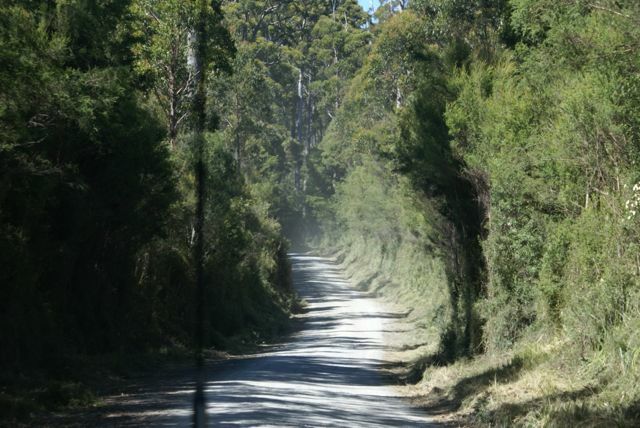 On both occasions I have driven this road I have found it to be quite enjoyable as it’s not as steep as many others and the road itself is in excellent condition. 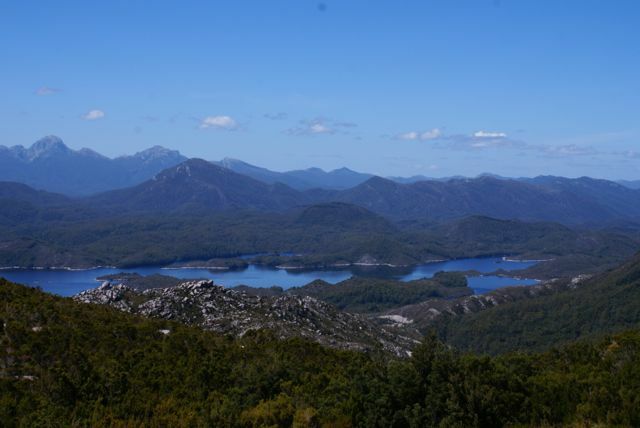 The views of the ranges around you is also spectacular. Just for something different we went up and down numerous hills and valleys once again and spent the night at Bradys Lake free camp. The next morning we continued on to Hobart staying at the showgrounds in Glenorchy a western suburb of Hobart. We would be here for more than a week as Deb needed a tooth crown replaced, I had doctors appointments and needed a medical exam for my license renewal. Deb also had an appointment with a respiratory specialist as her chest problems were getting worse and needs further treatment. We then returned to Sunset Beach for another 5 nights and was able to get out fishing in the kayak two more days and caught a good feed of flathead & a squid once again. Rod & Tony were here also and they smashed the flathead outdoing my catches each time. They are hooked on this place, excuse the pun. I’ve also mastered the art of filleting these beasts, which makes them much more enjoyable to eat. We picked up a hint front some friends to coat the fillets in crushed up salt & vinegar chips. Yum!!! It was also great to catch up with Harvey & Marie and hopefully we will catch up with them one day.